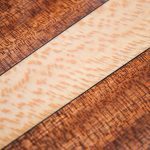 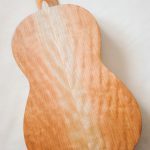 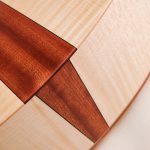 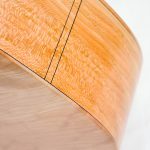 It’s been a while since my last post here, because I’ve been busy working on various guitar commissions, and getting used to the new workshop. 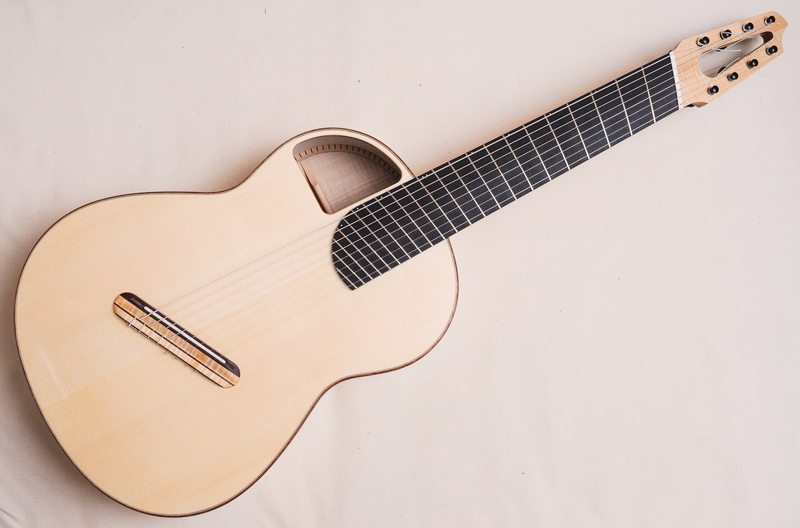 I’ve made a couple of 8-string Brahms guitars and a couple of 6-string classical guitars in there now, and it’s working well. 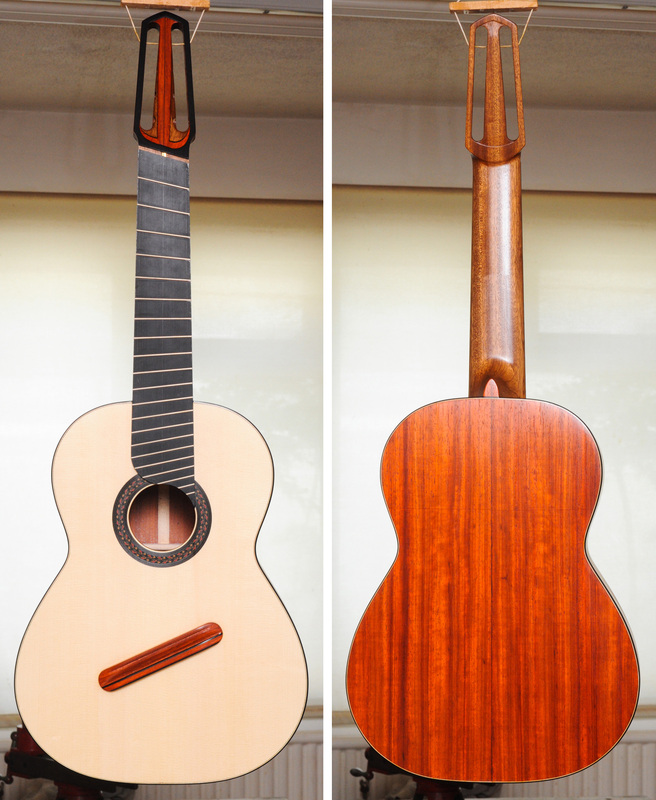 Here are some photos of my most recently finished commission, for Joseph Ehrenpreis. 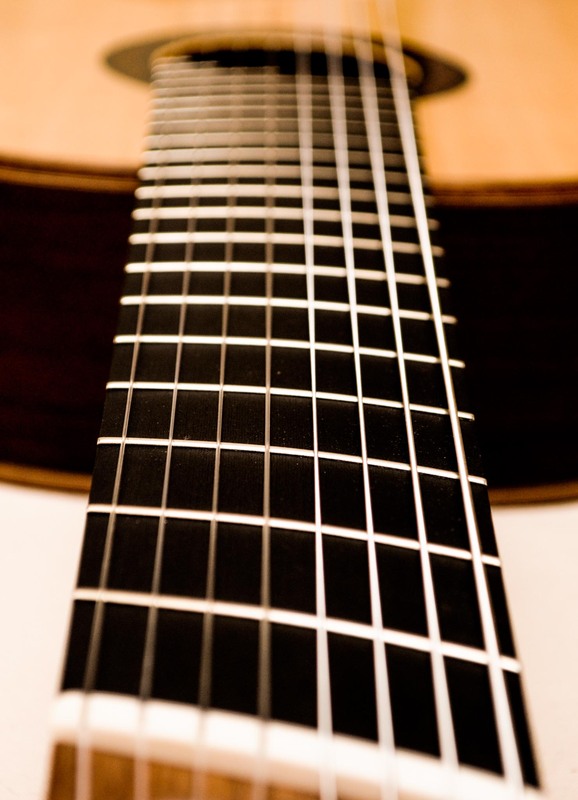 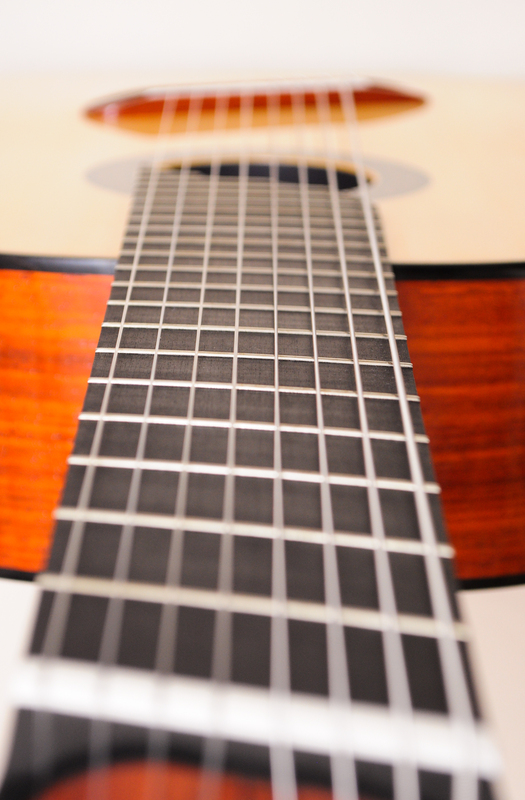 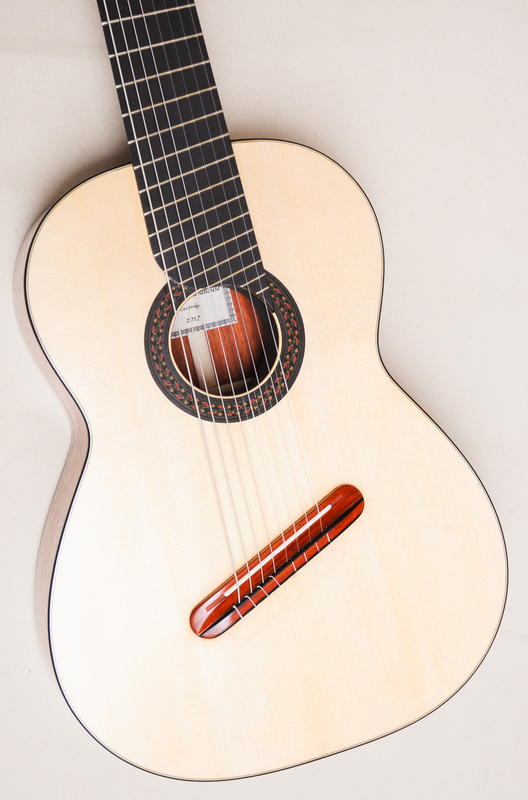 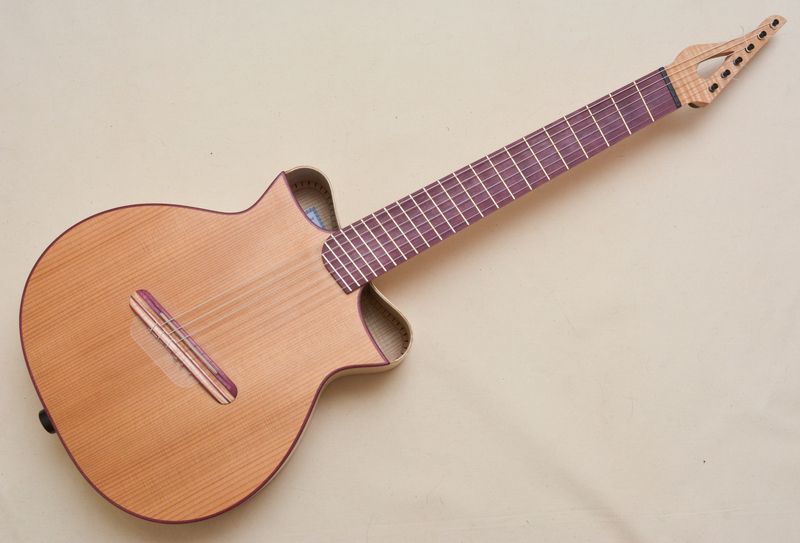 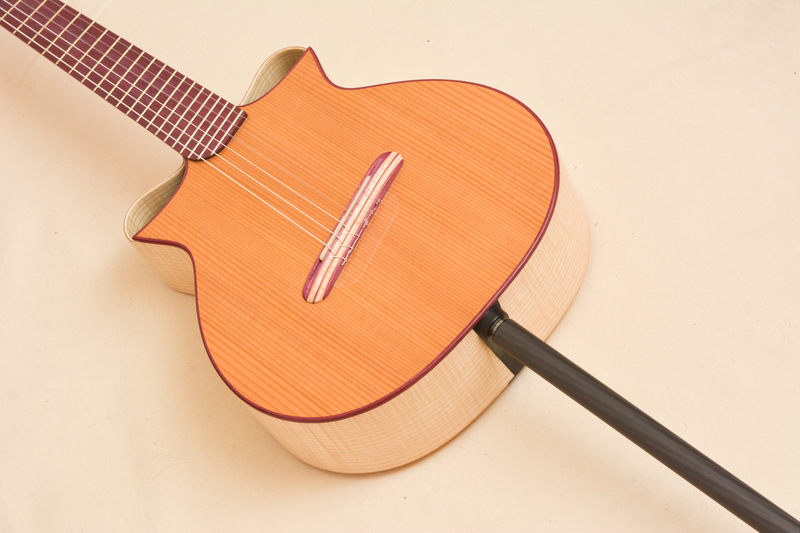 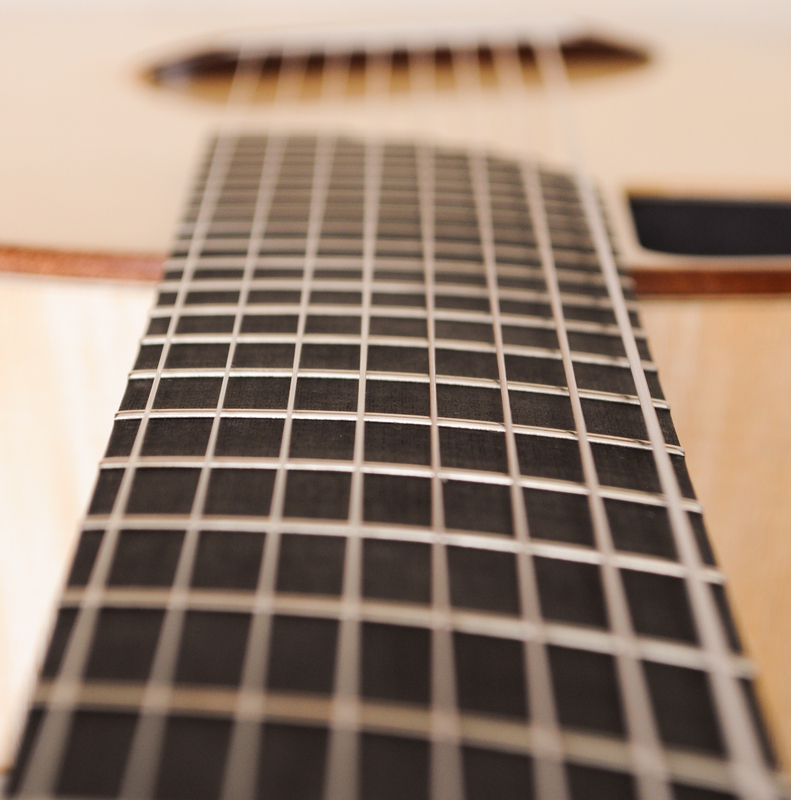 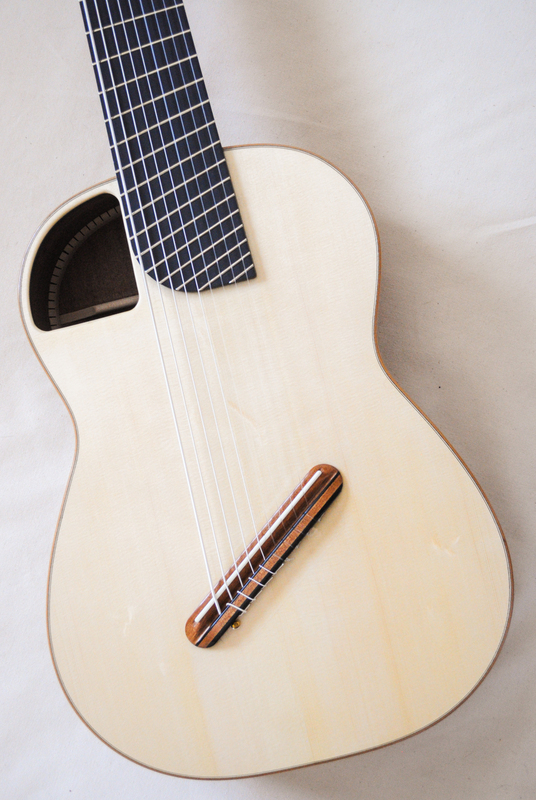 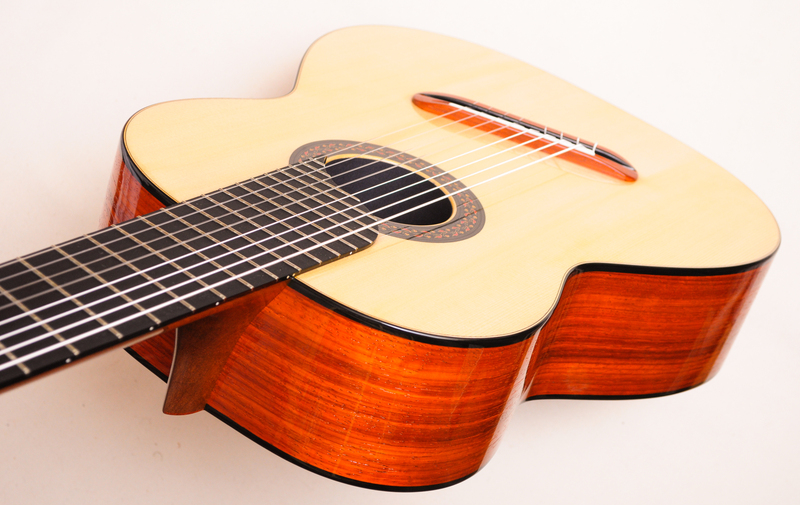 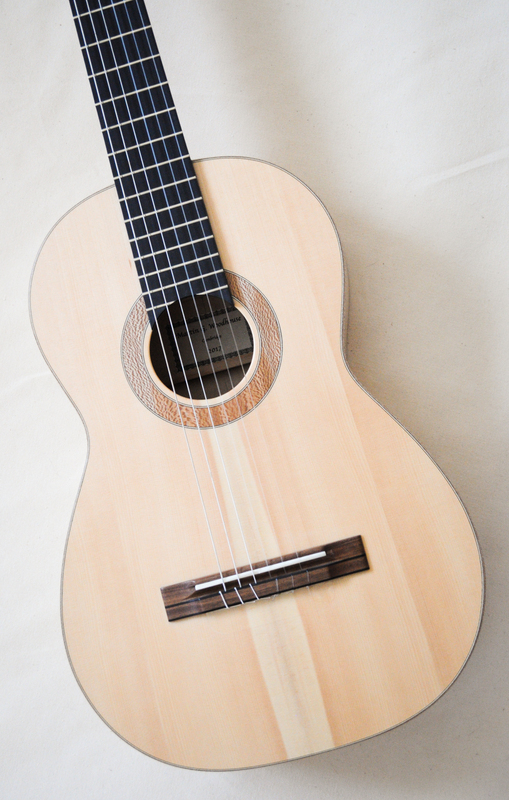 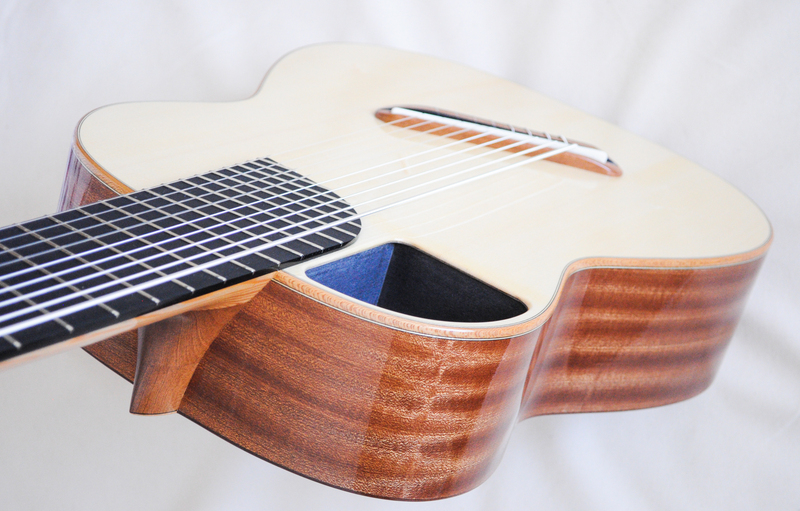 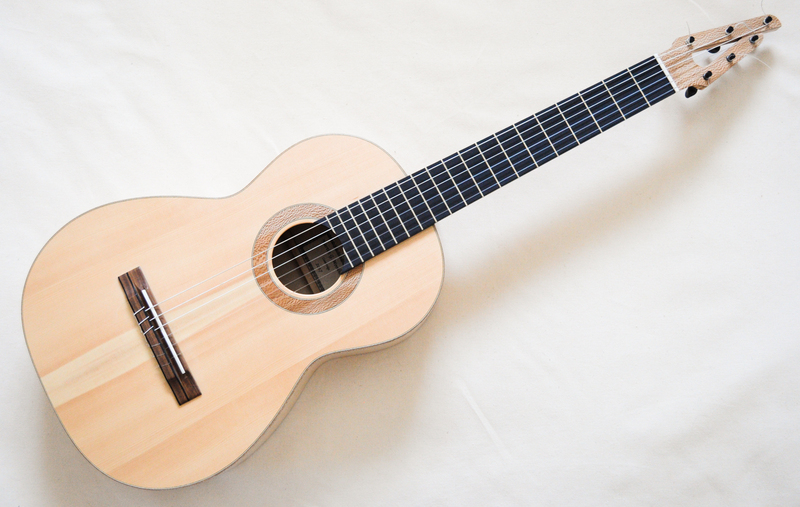 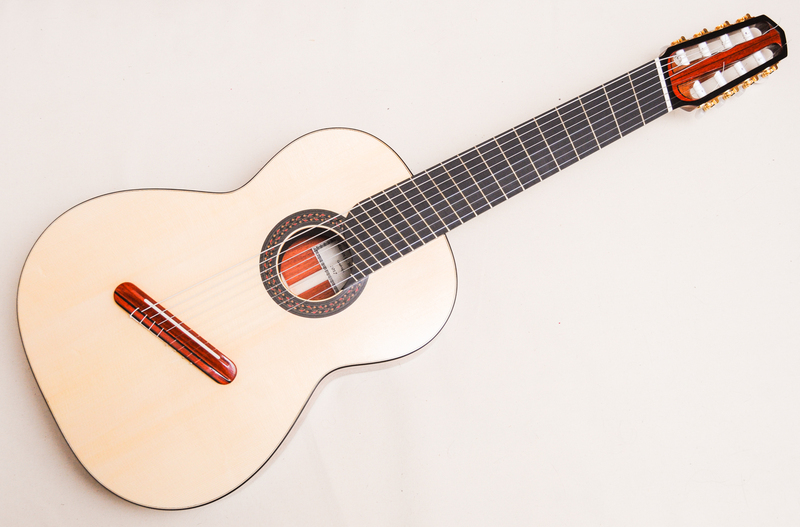 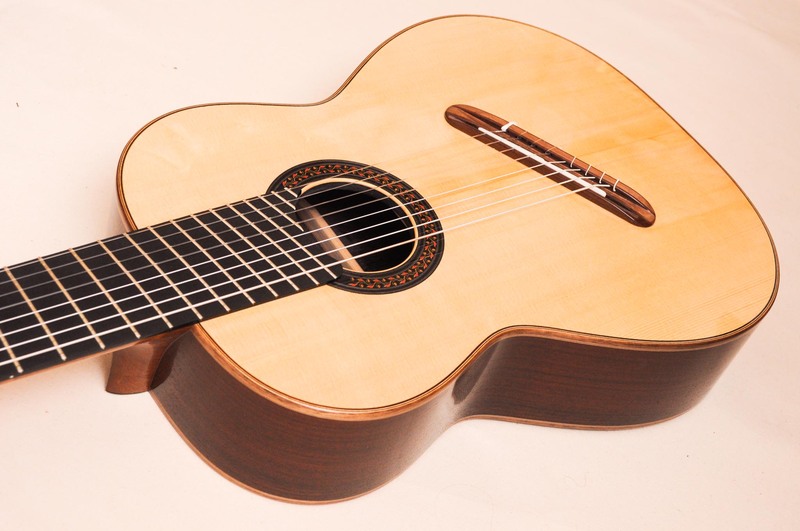 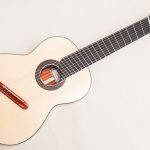 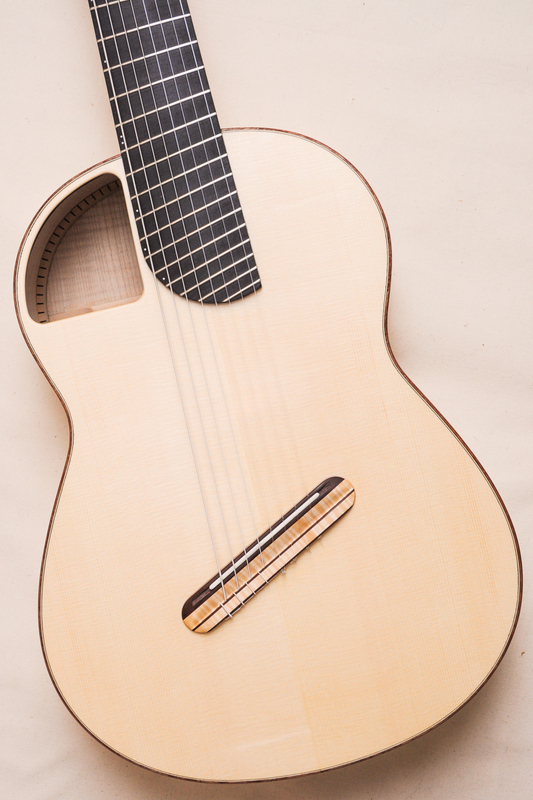 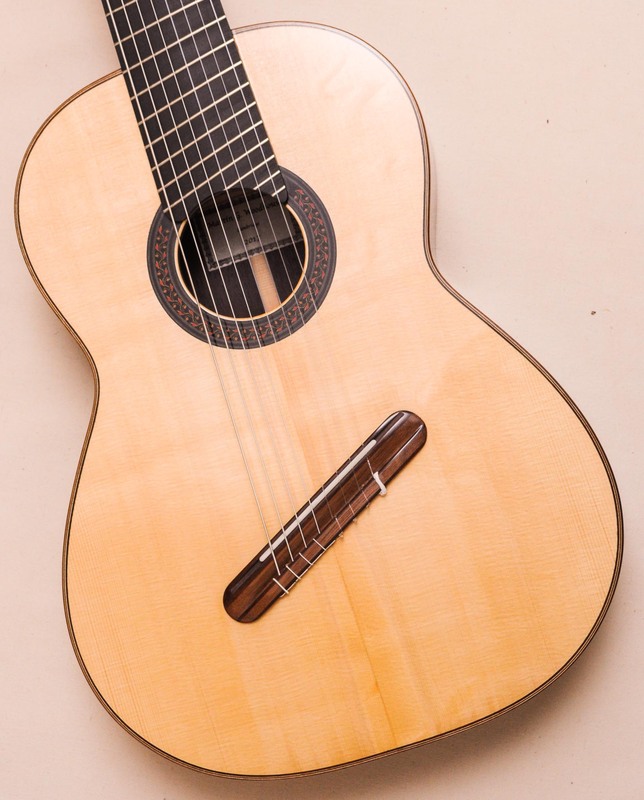 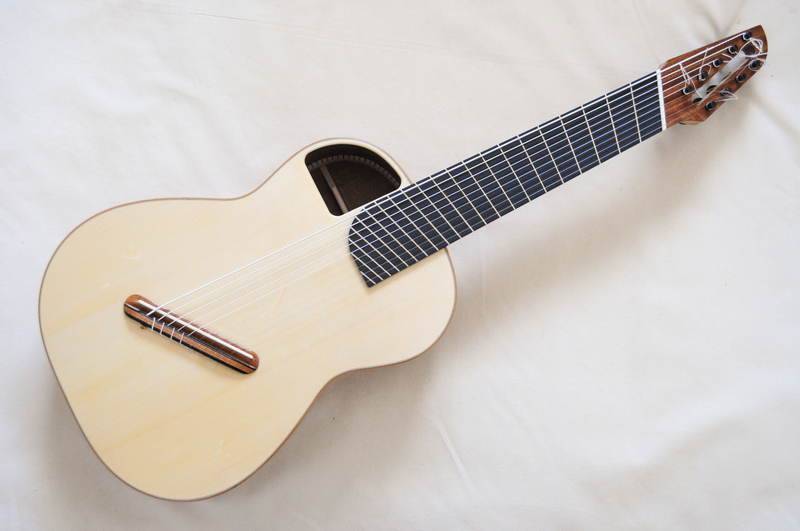 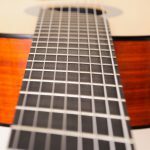 The idea was to make a modern short-scale classical guitar, with a big sound and very comfortable playability. 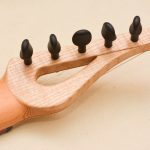 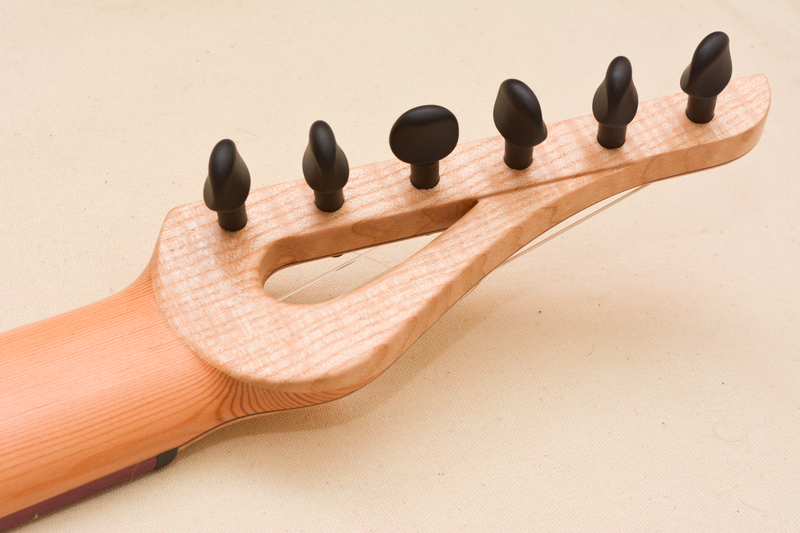 After considering various different designs, we decided that a development of my Leiden model would be the best way to get the playing setup and sound that he wants. 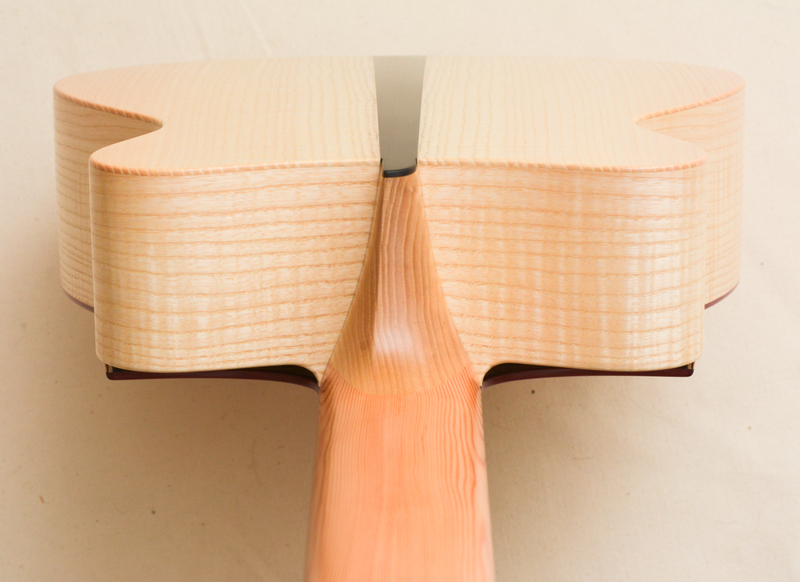 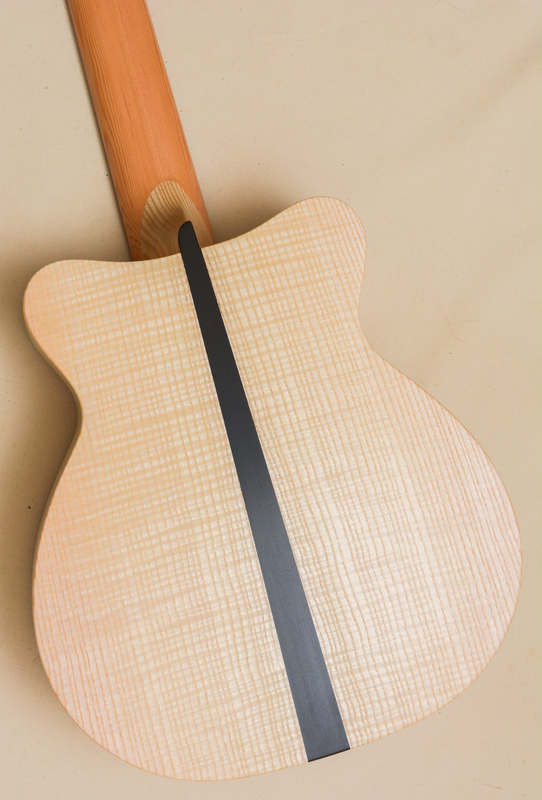 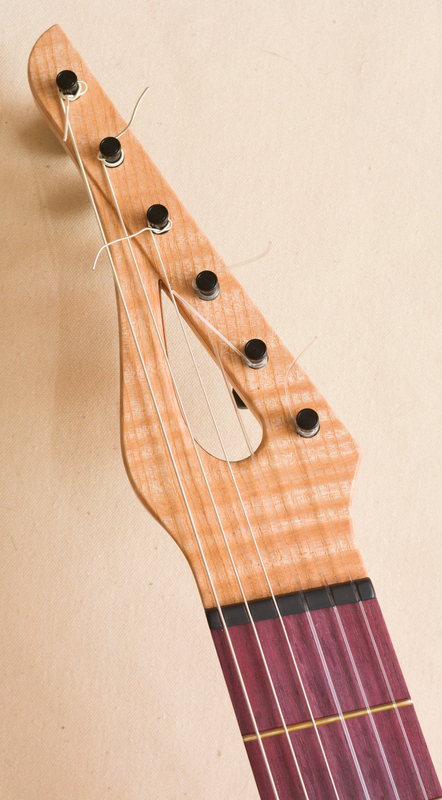 Neck: Douglas fir, carbon fibre and ash. 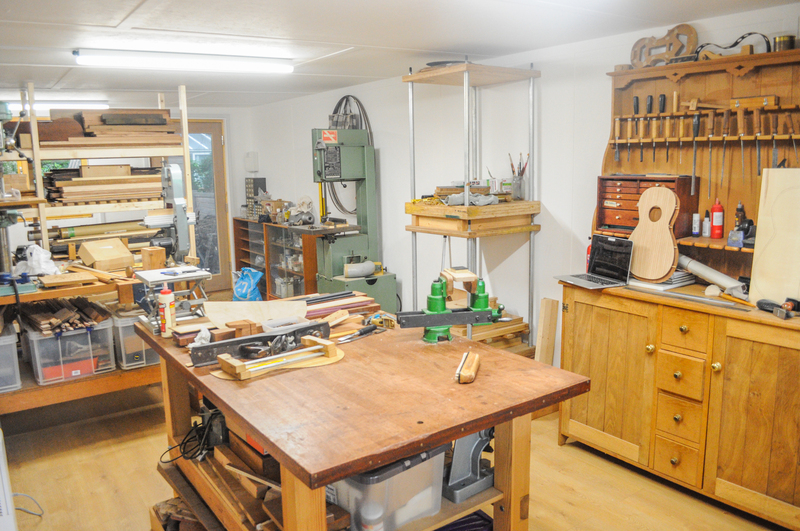 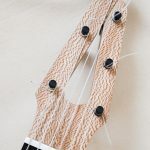 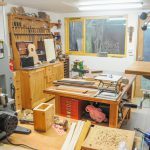 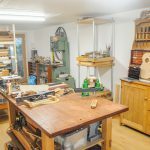 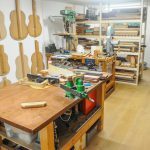 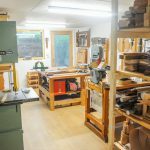 The power was connected to my new workshop yesterday: finally I can make guitars again! 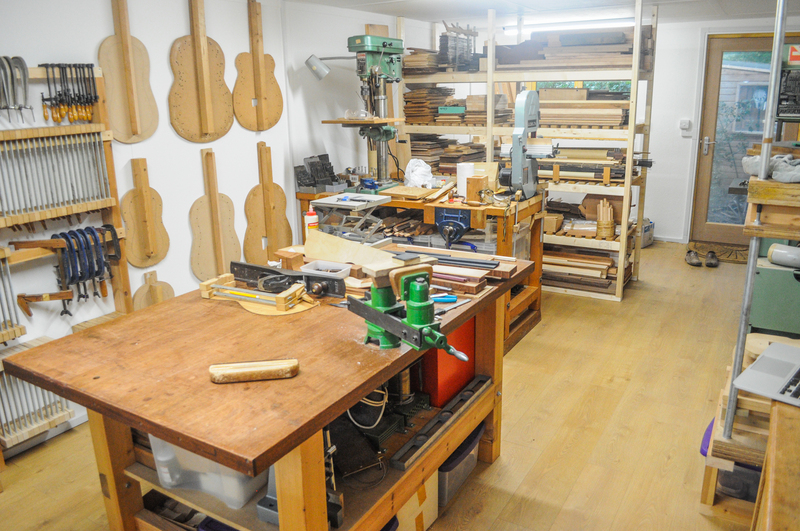 There’s still some organising and finishing off to do, but I did my first bit of guitar work in there today. 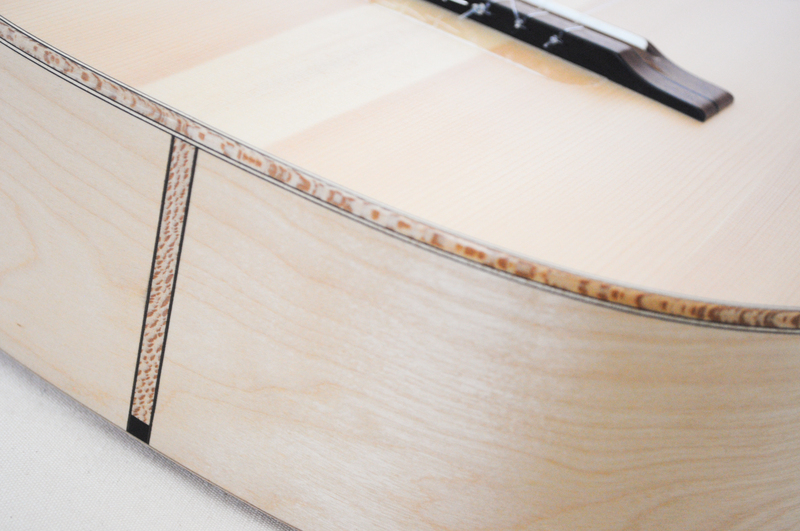 Great to be making instruments again! 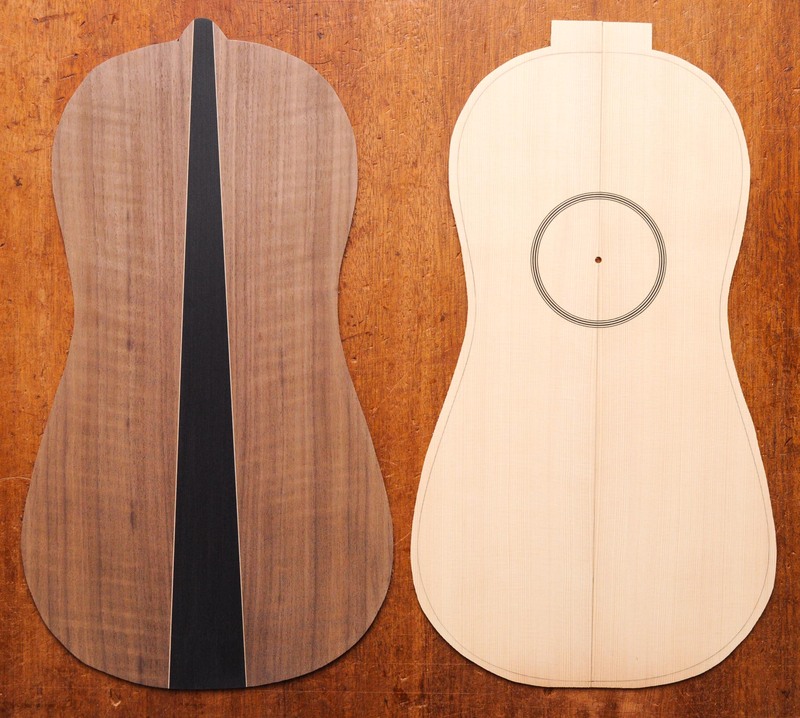 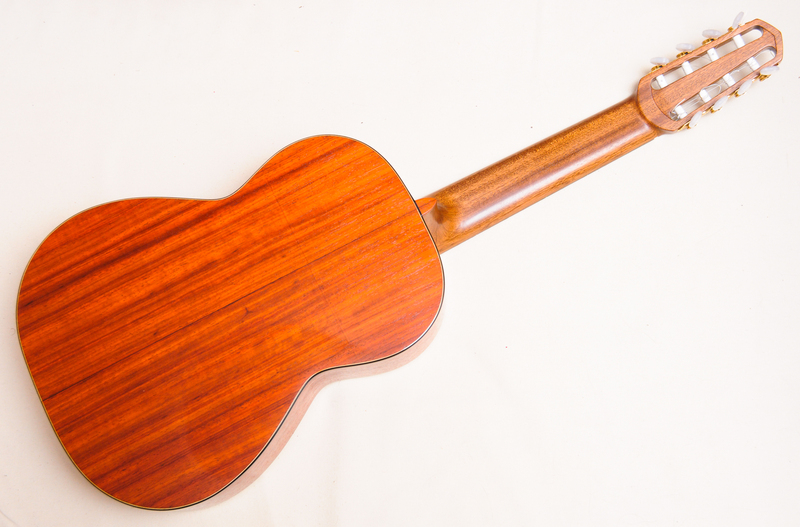 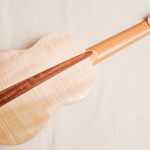 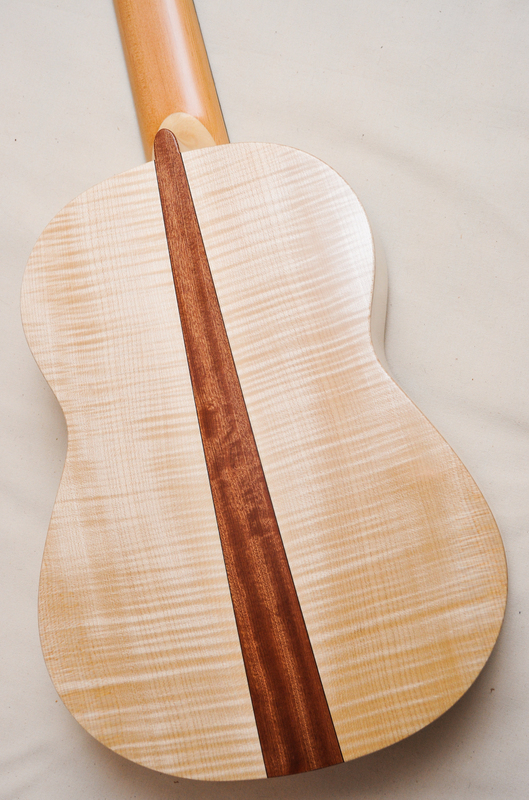 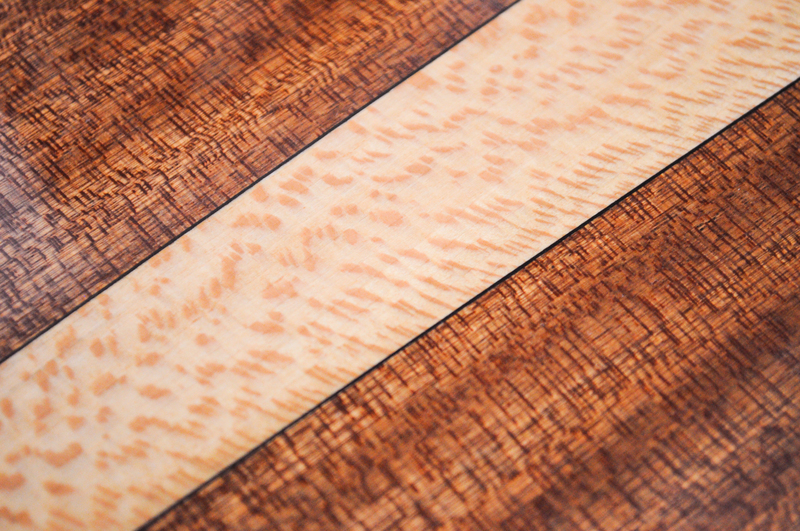 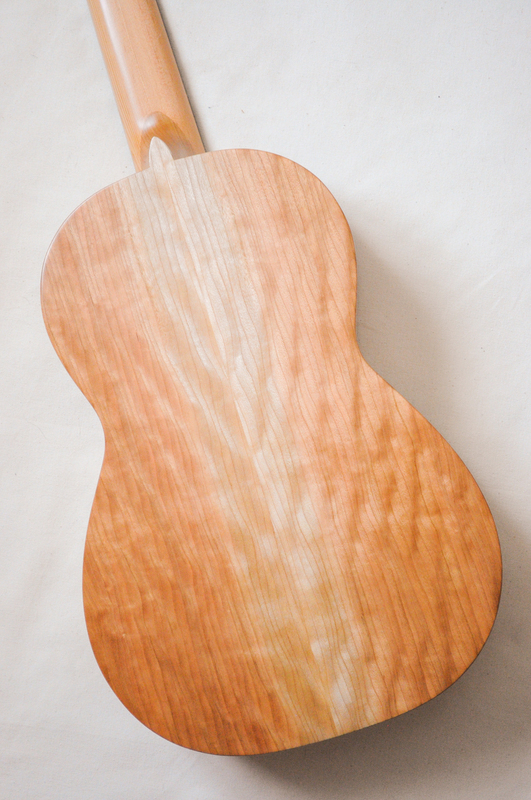 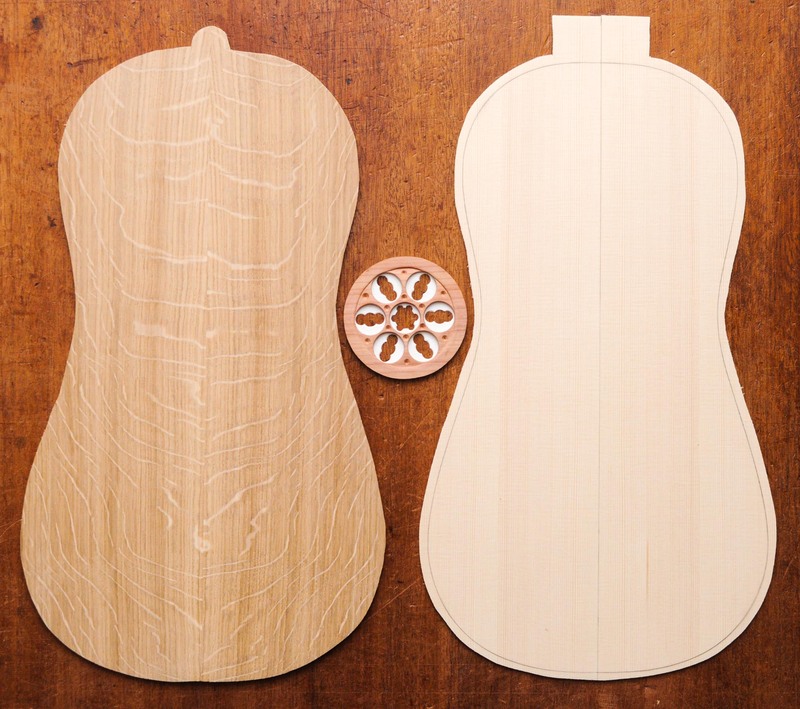 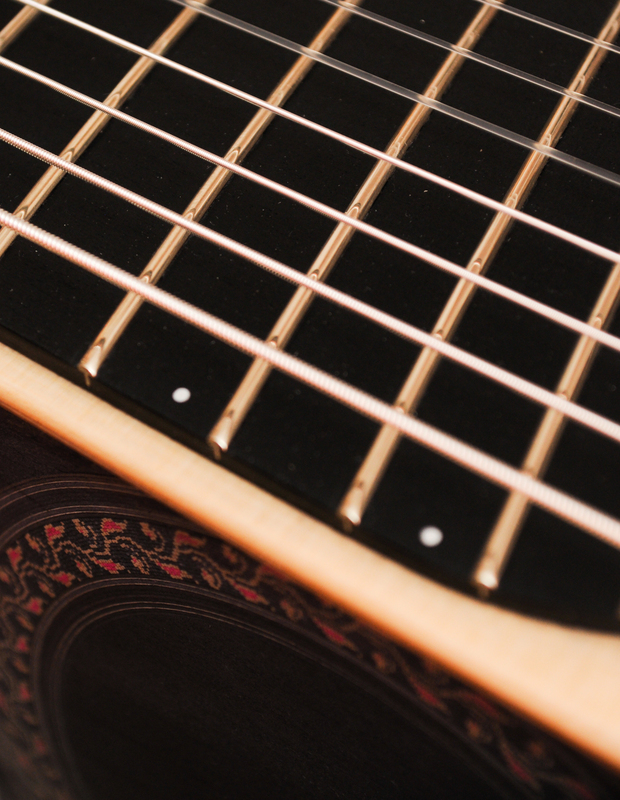 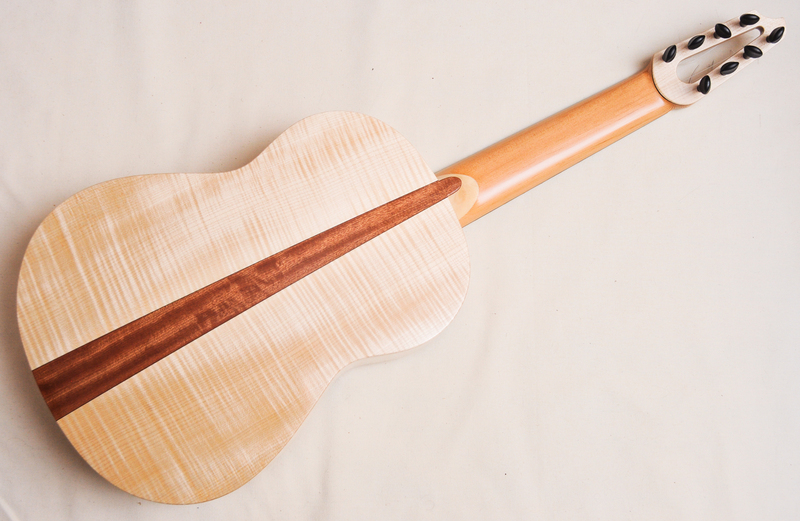 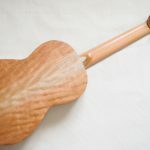 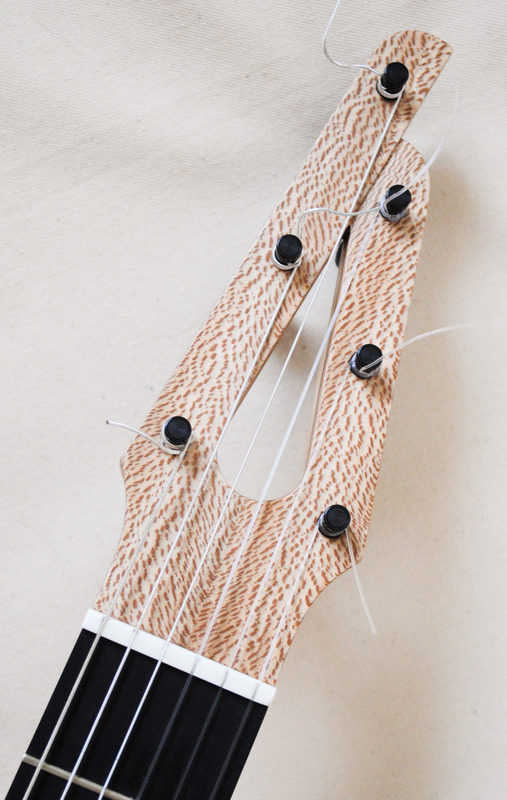 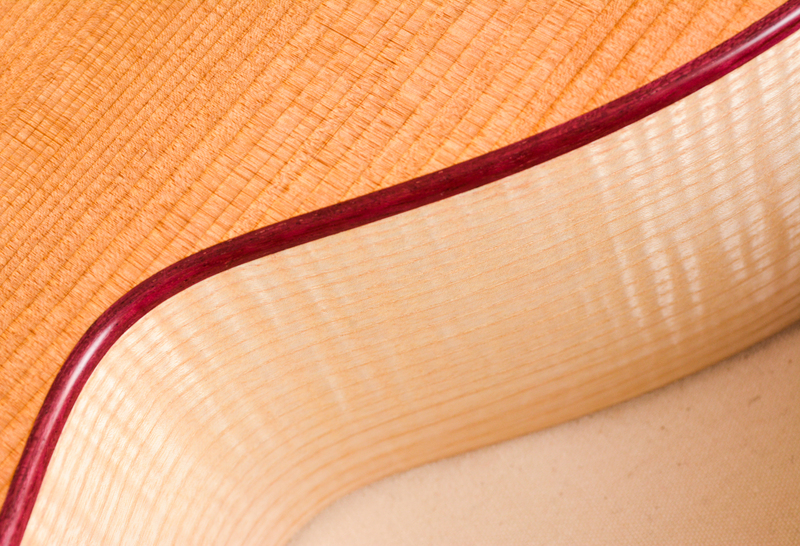 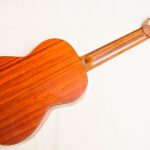 The first was a prototype classical guitar which I made to test out some different woods and new design ideas. 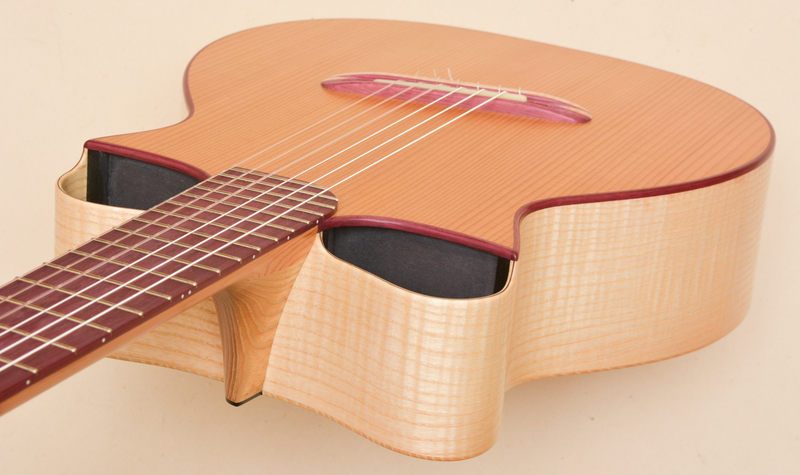 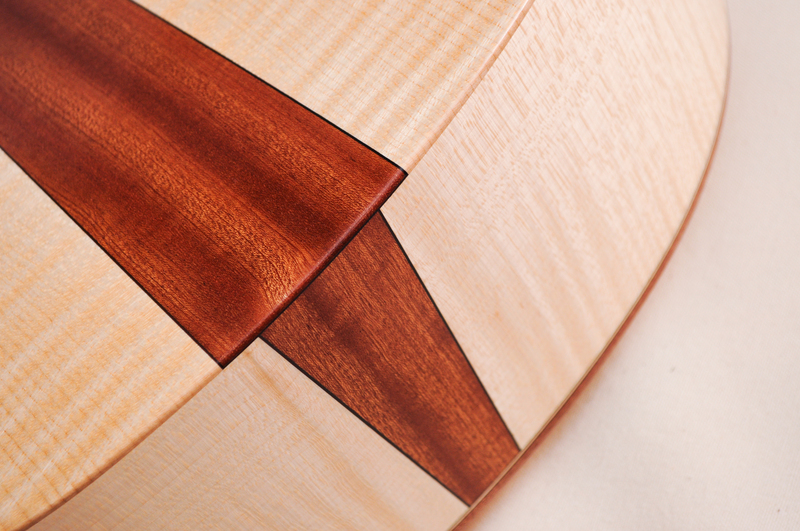 It has an Austrian stone pine top and Finnish birch ply back and sides. 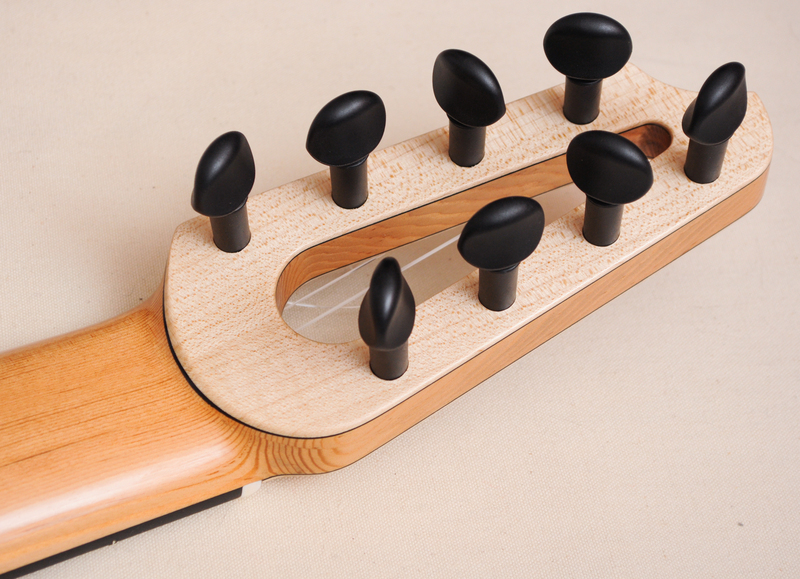 The result is a nice, simple design, which I might develop into an affordable student model in the future. 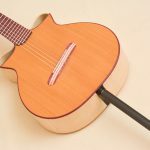 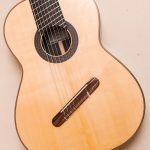 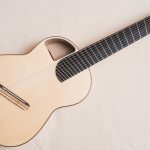 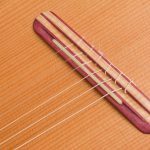 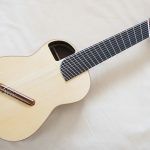 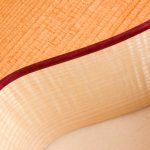 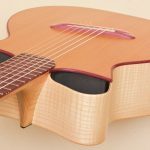 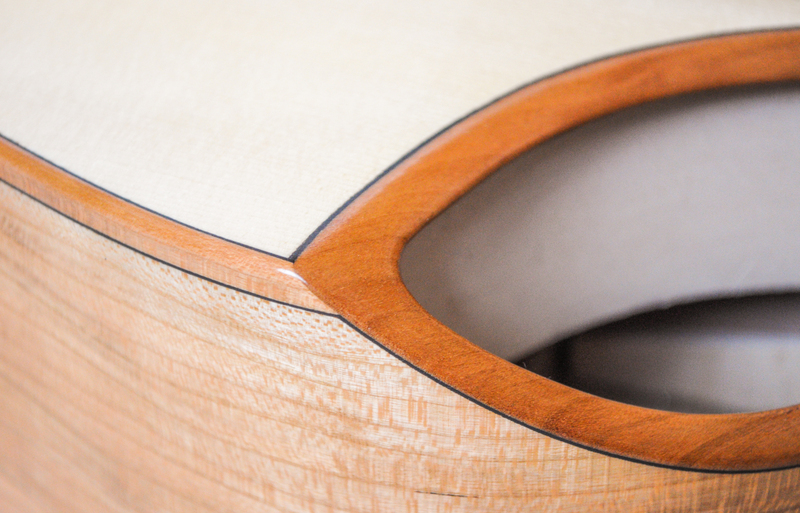 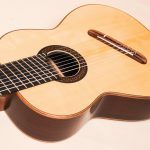 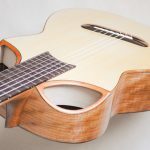 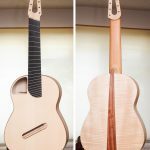 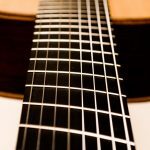 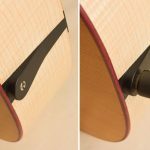 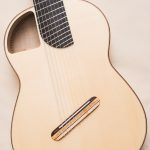 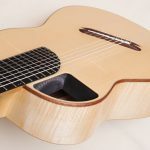 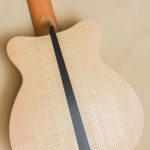 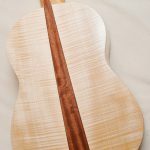 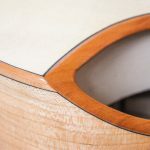 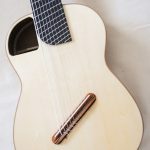 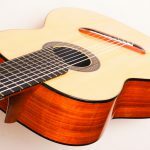 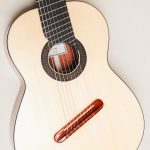 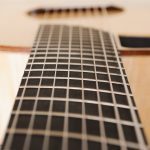 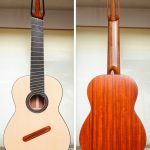 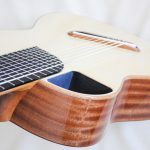 The second was an interesting classical guitar commission / design collaboration, which ended up producing a very successful new design. 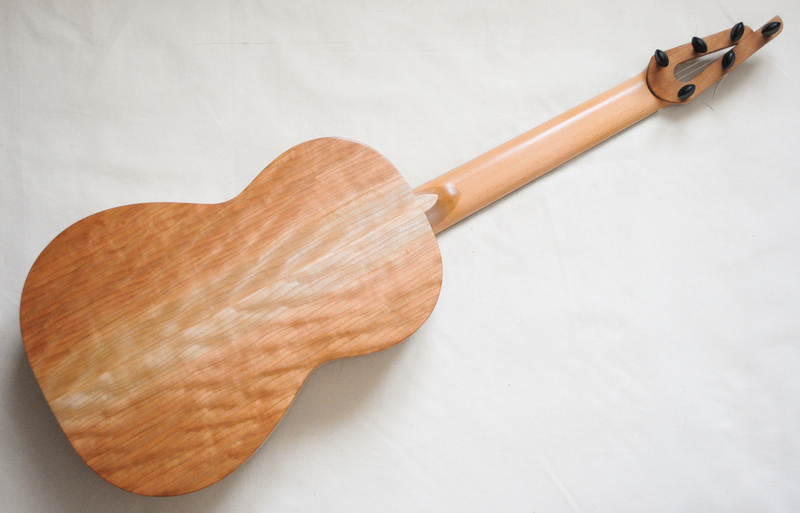 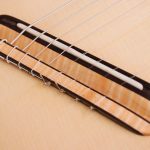 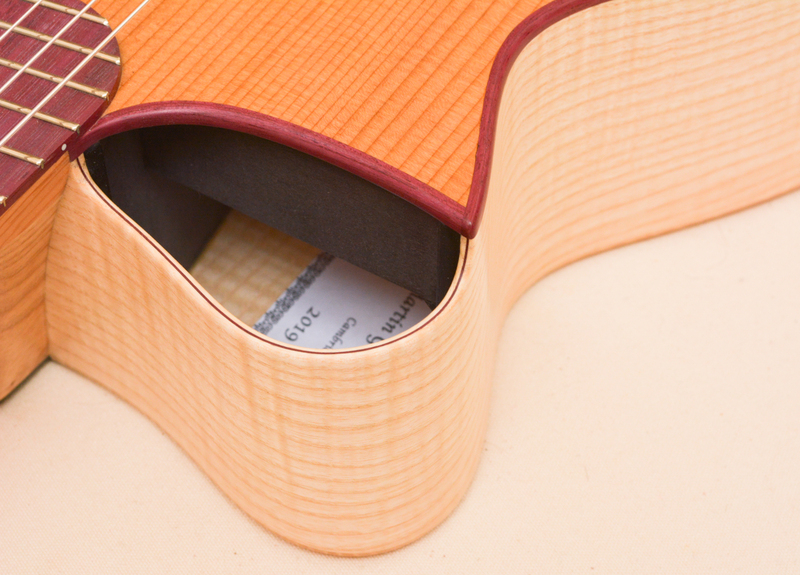 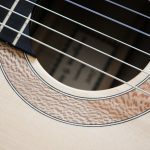 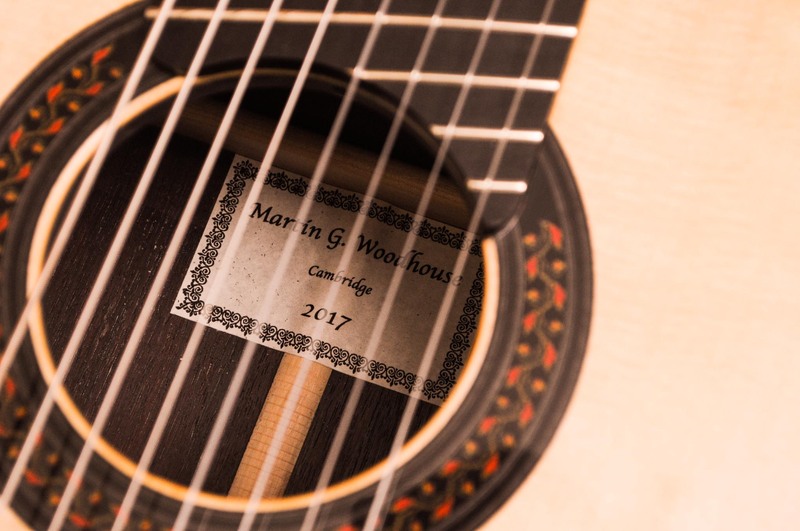 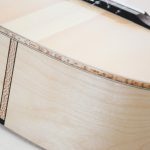 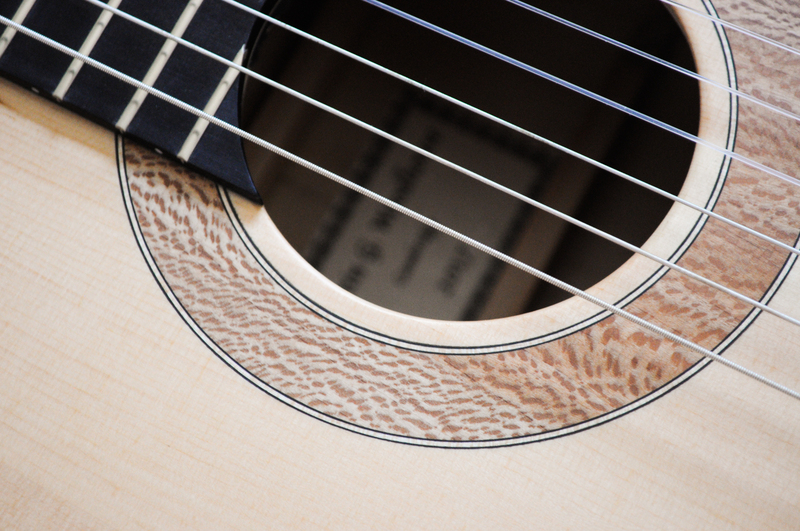 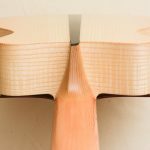 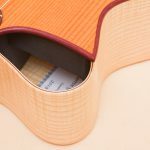 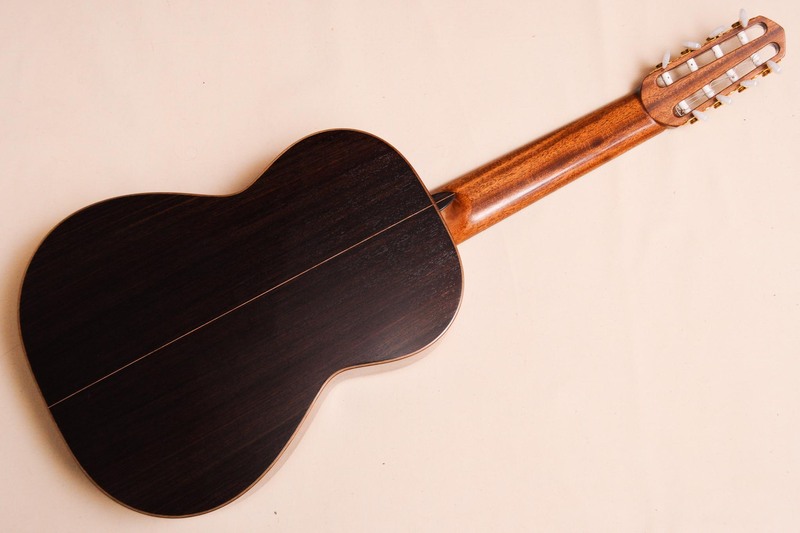 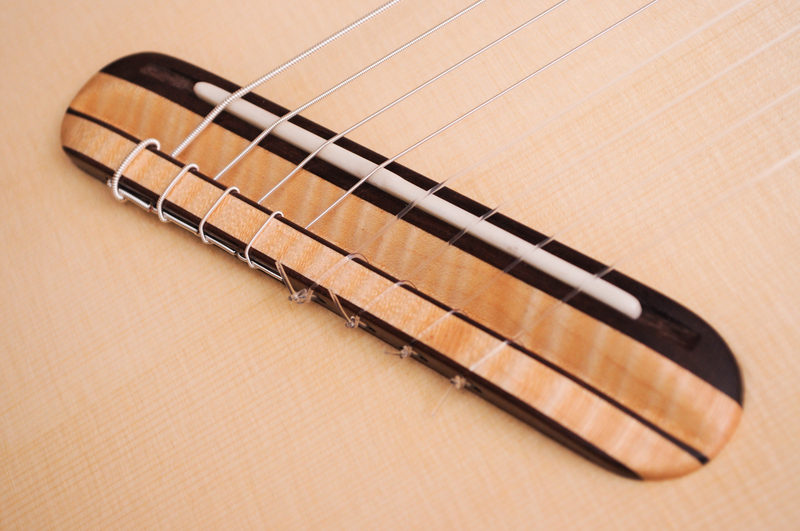 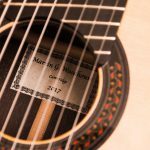 It has a European spruce top, American cherry back and sides, Douglas fir and carbon fibre neck, and katalox fingerboard. 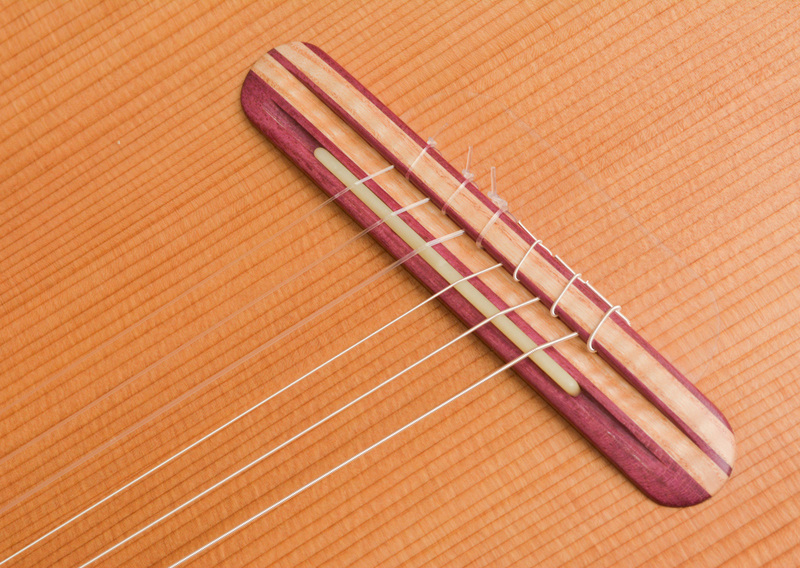 String lengths are 630-650mm. 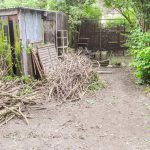 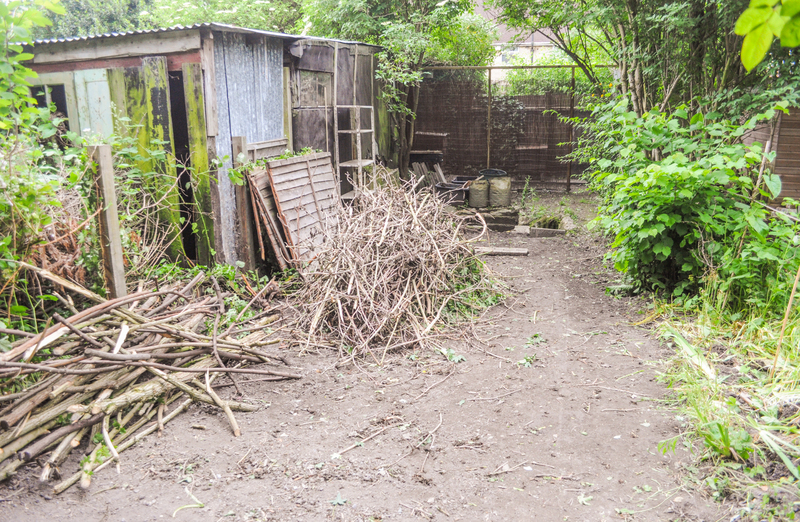 After a busy few months of childminding and preparing the ground for the building of my new workshop, the building work finally started at the end of June. 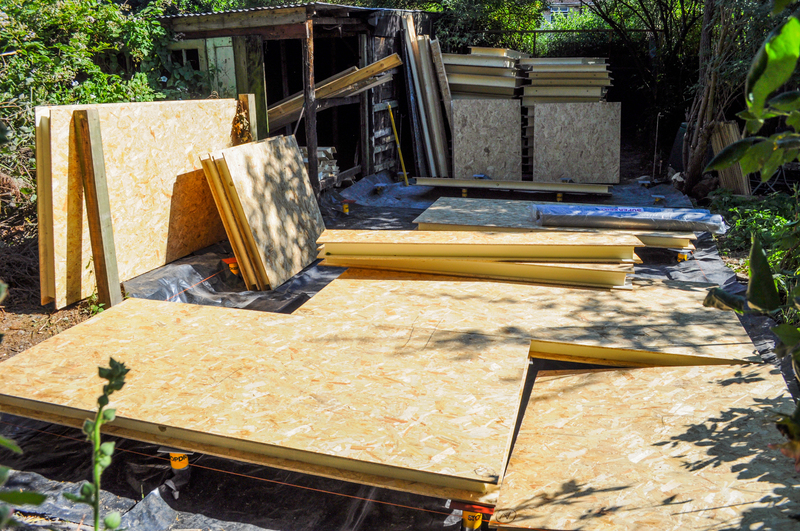 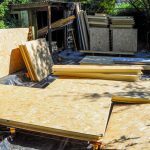 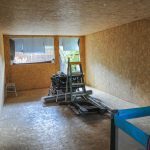 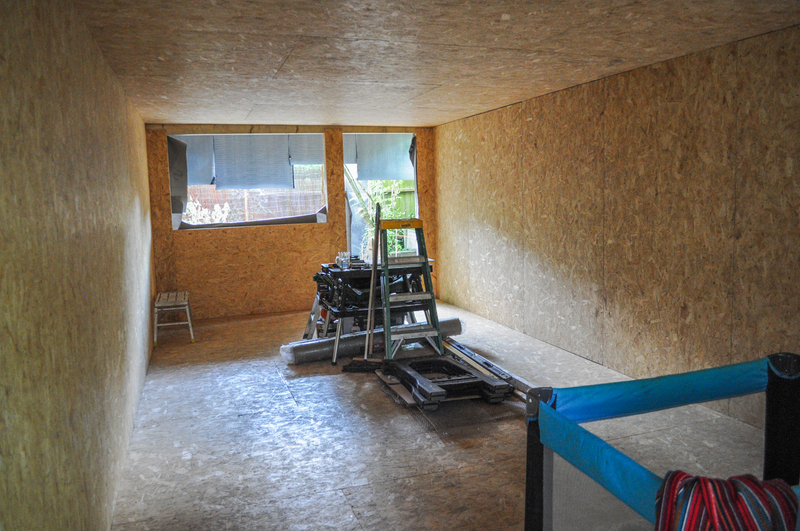 Now the shell of the workshop is built, and it just needs painting and flooring and wiring and cladding and doors and windows and… it will probably be another month before I can move in and start working there, but it’s great to see some progress after so many delays. 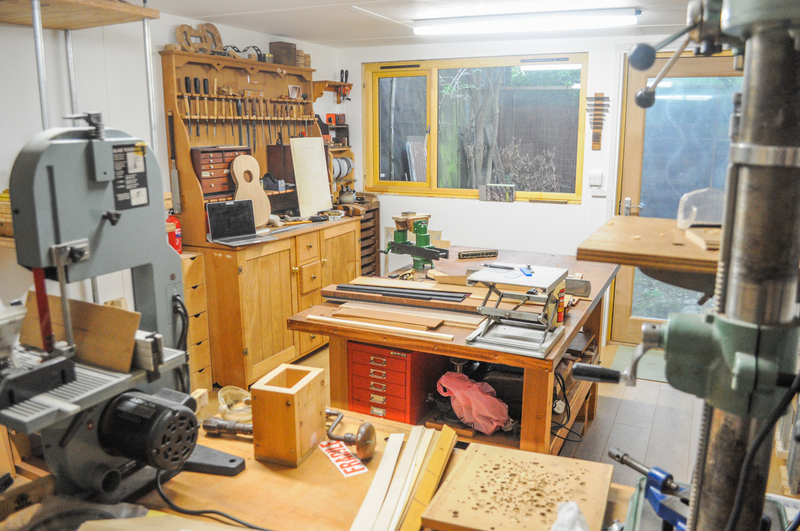 I think it will be a very nice space to work in when it’s all done. 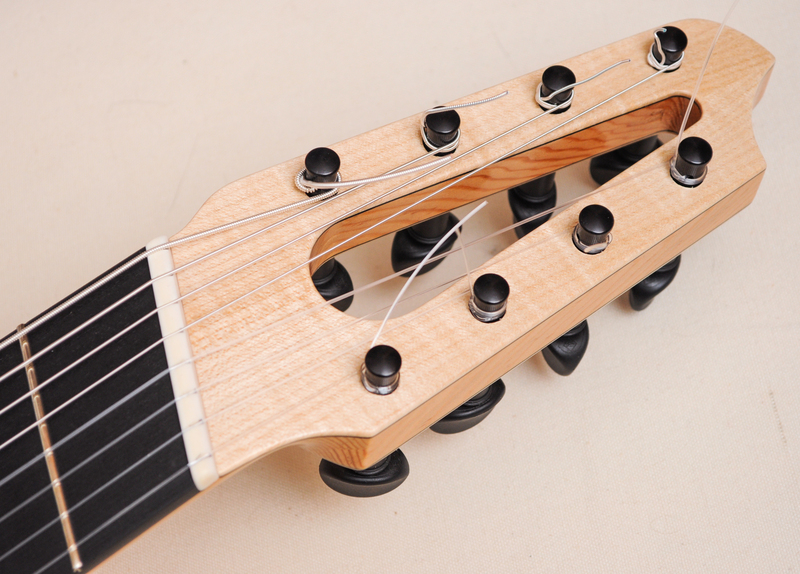 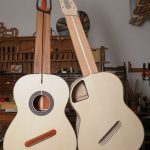 Finished these two 8-string ‘Brahms’ guitars this month – one commission and one experiment. 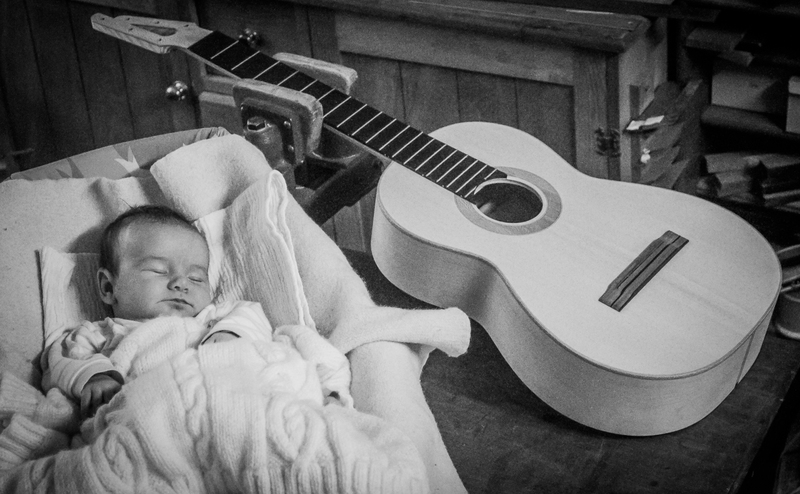 Both settling in well and already sounding good. 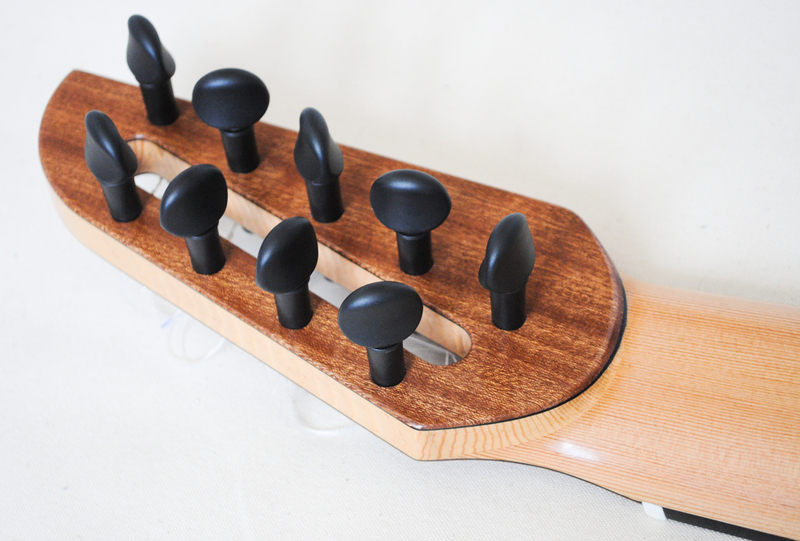 The commission will be off to the USA in a couple of weeks, but I’ll hang on to the experiment for a while and get some players to test it and give feedback… maybe I’ll try to record some videos of them too. 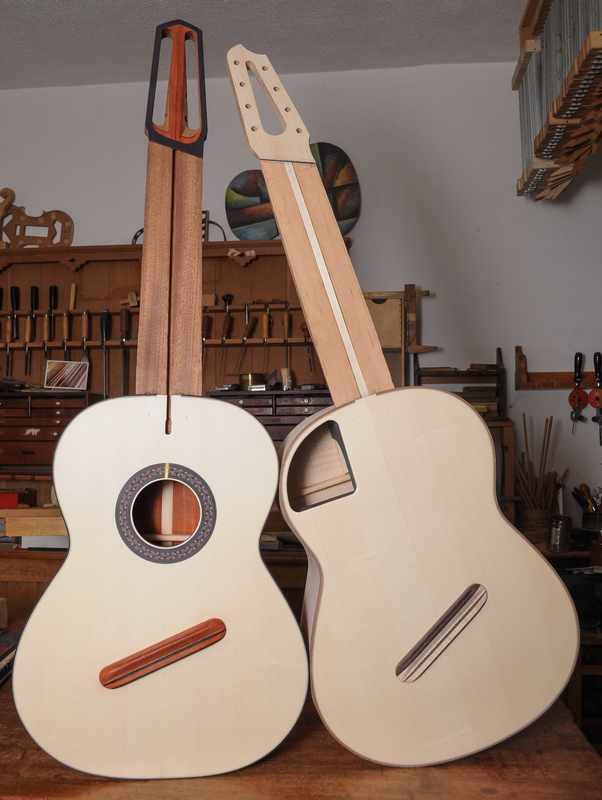 Now that these two are off the bench, I’ll be taking time out from instrument making to build my new workshop, so this may be my last new instrument post for a few months (although I still have a couple of things on the go which I’ll finish off if I have time this summer). 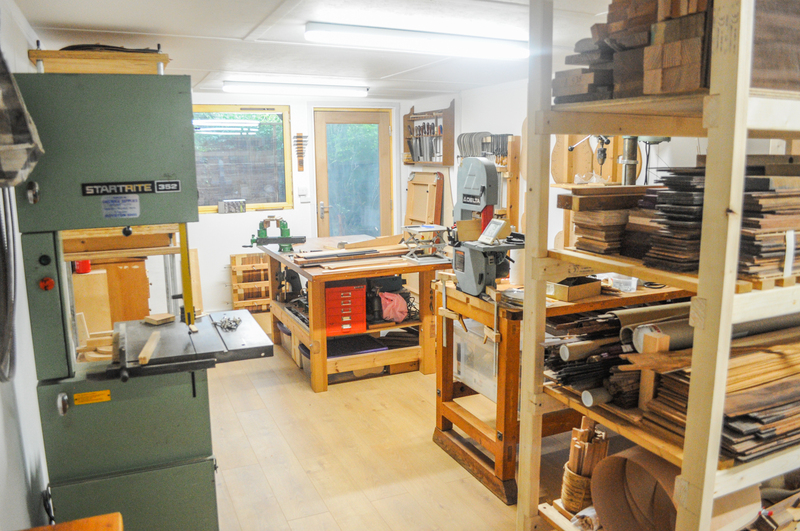 Normal service will resume in the autumn. 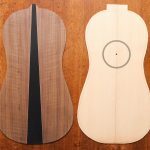 I’m making two 8-string classical guitars at the moment: one commission and one experimental prototype, testing out a new design I came up with recently. 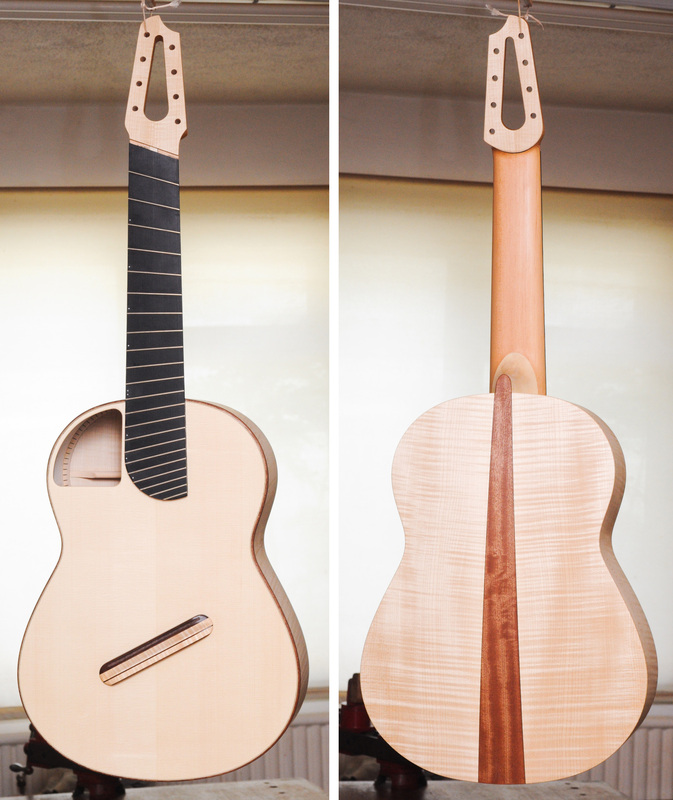 Looking forward to being able to compare these two in a couple of weeks! 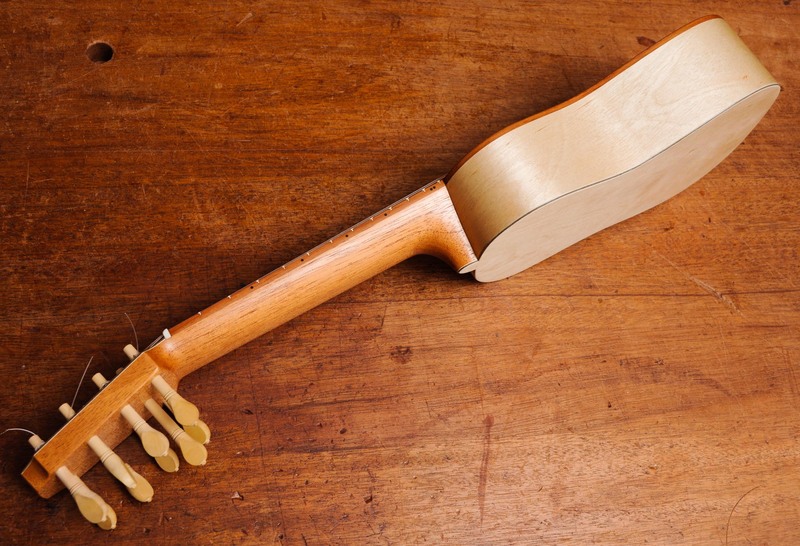 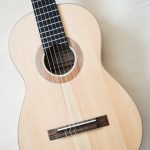 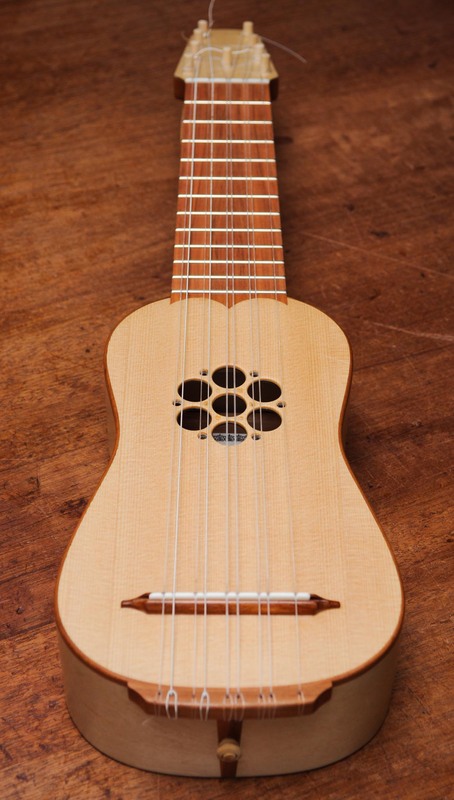 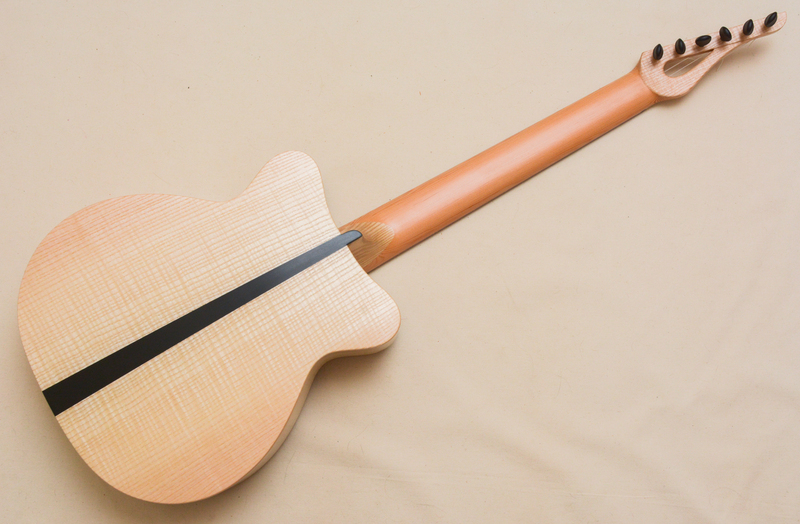 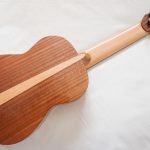 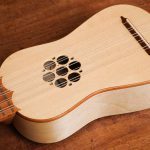 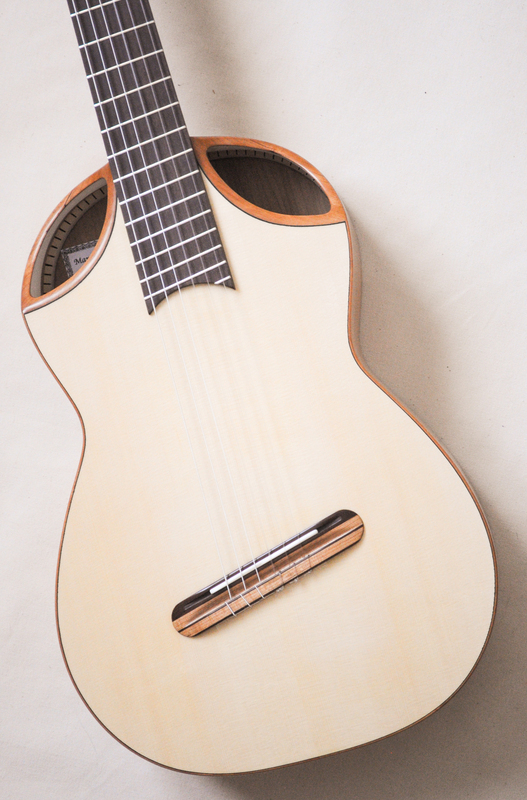 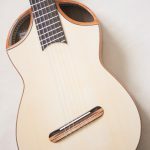 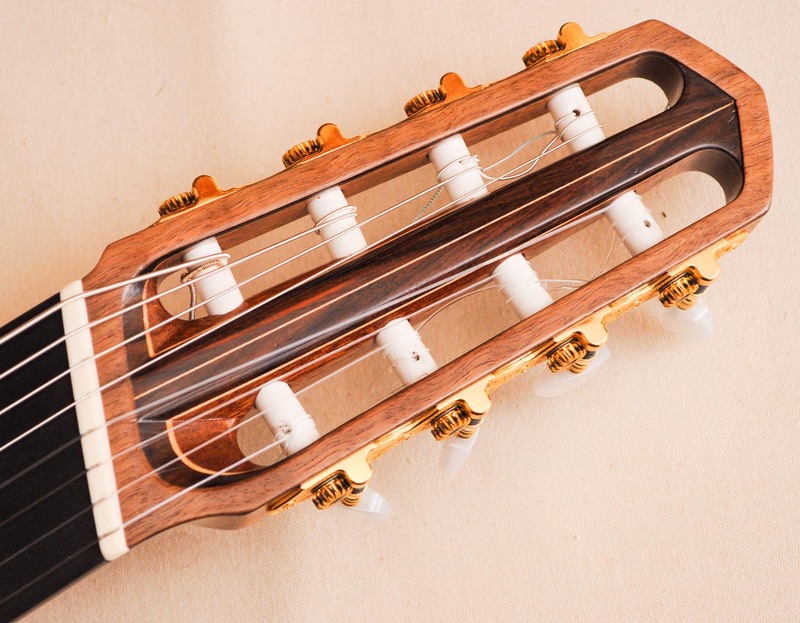 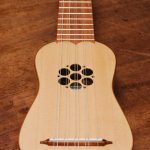 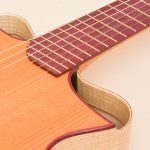 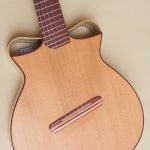 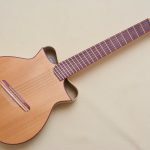 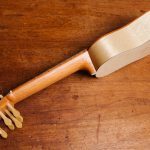 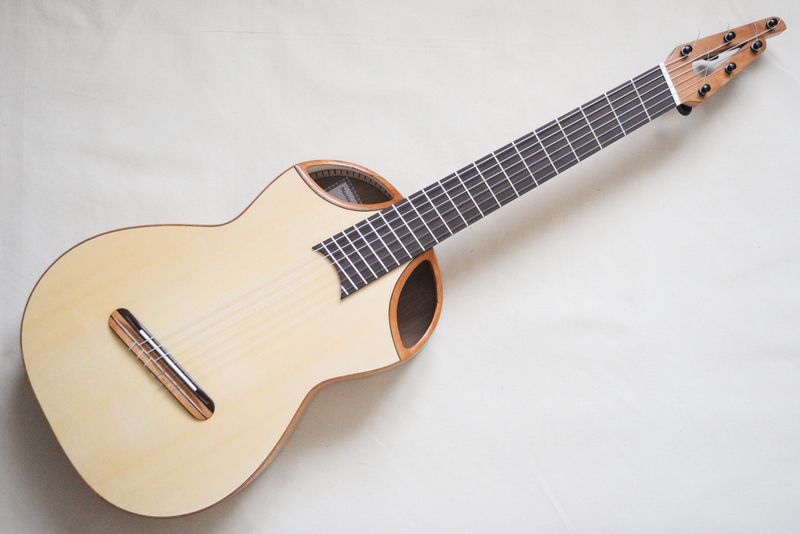 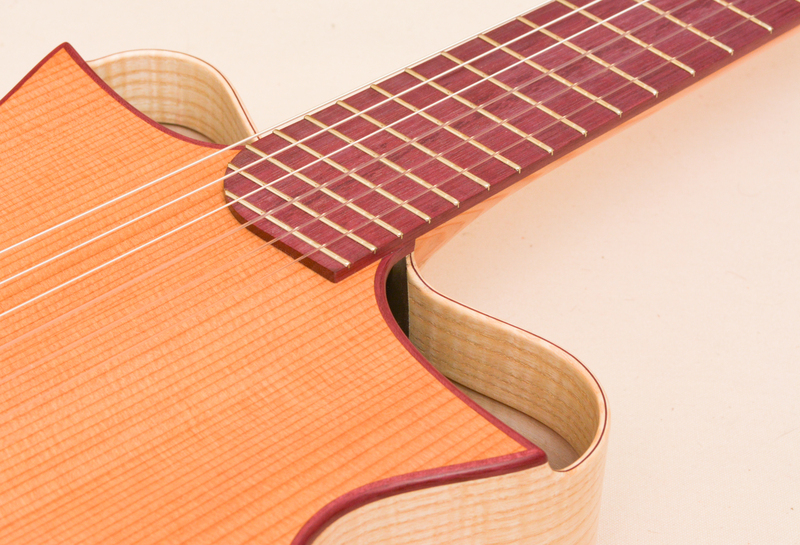 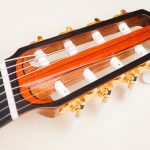 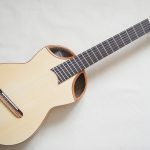 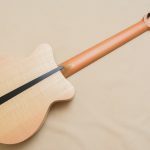 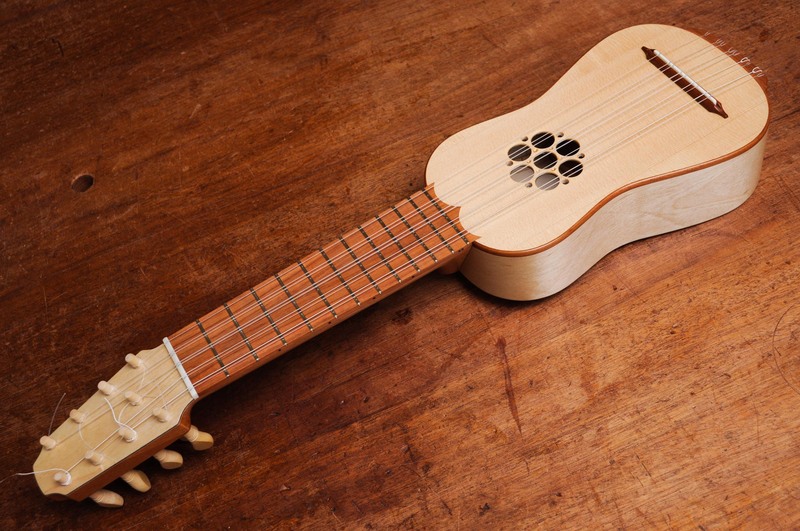 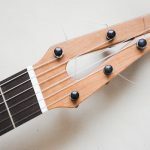 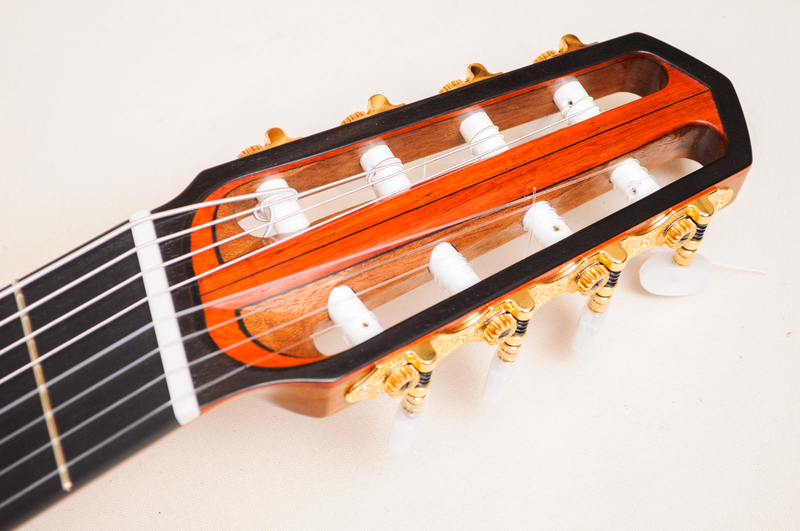 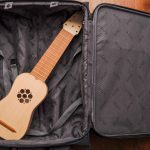 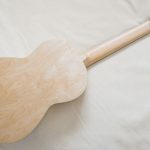 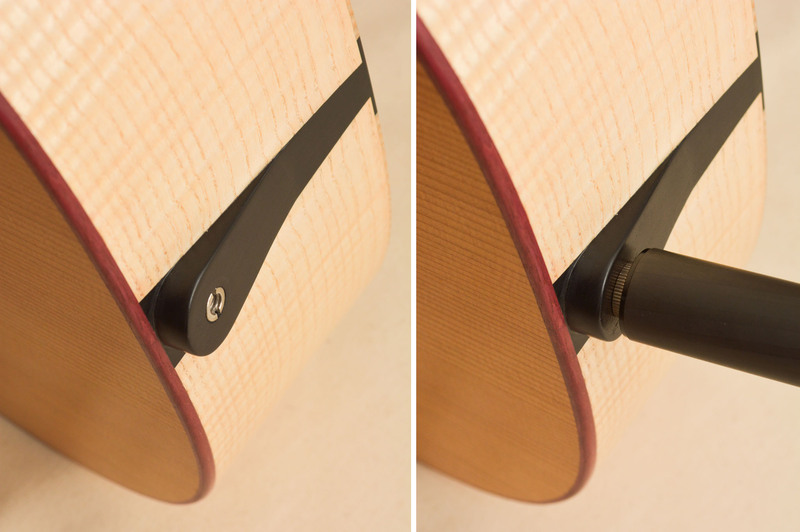 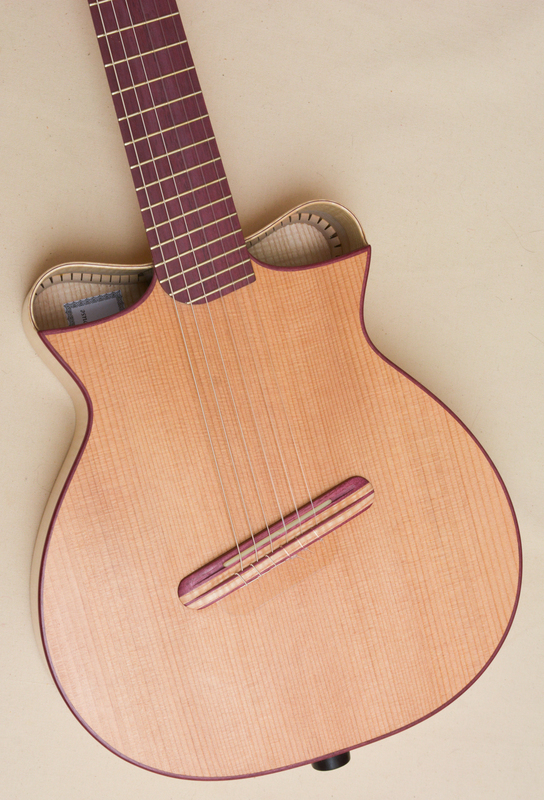 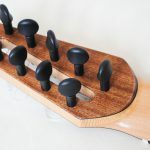 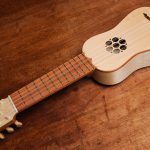 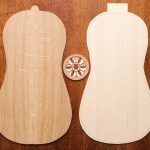 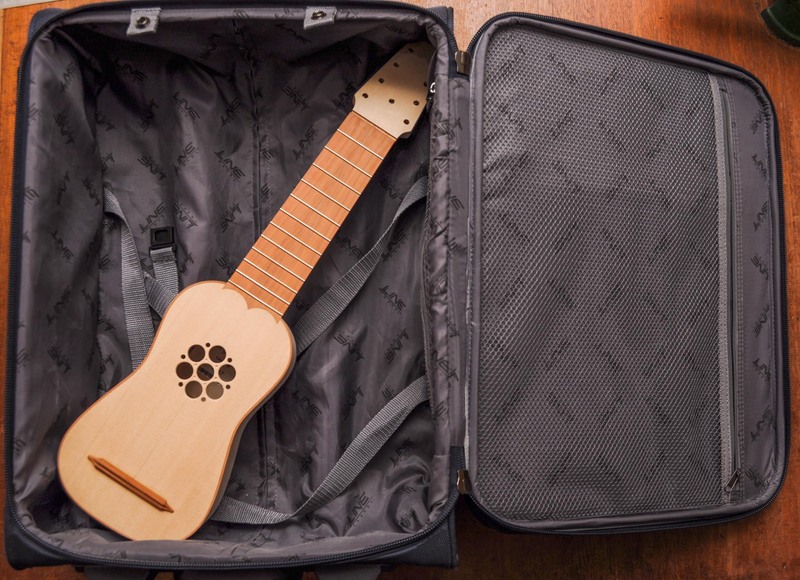 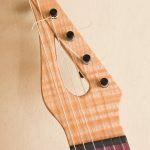 It’s a cross between a baroque guitar and a soprano ukulele (which I’m calling a baroqulele), designed to fit into standard hand luggage, as a fun travel instrument. 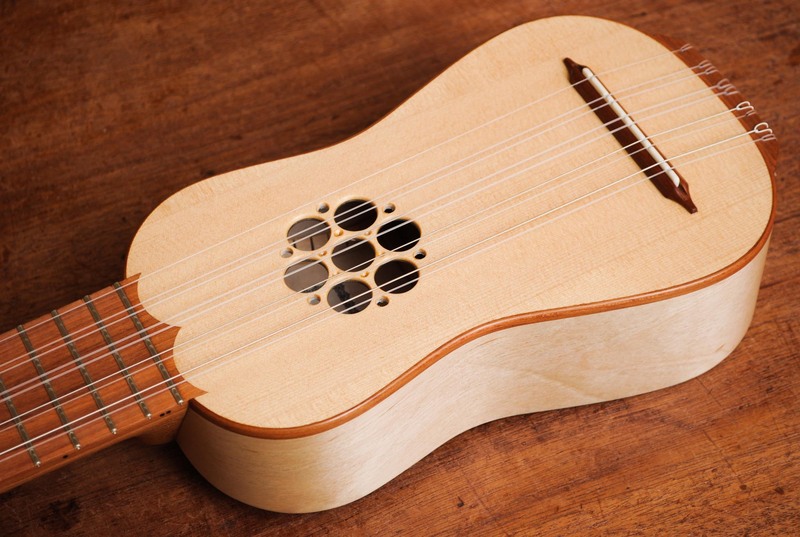 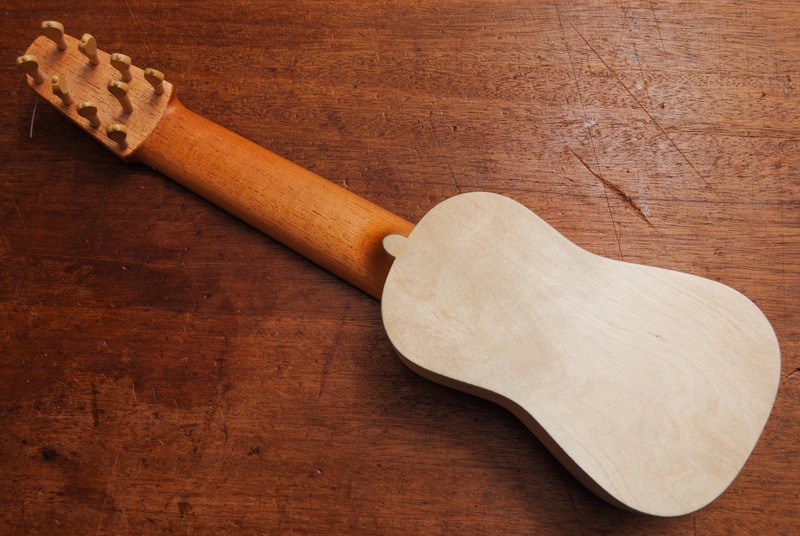 The first will be my attempt to reproduce a good, but inexpensive players guitar of the 17th century. 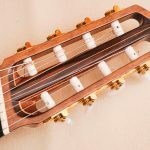 The surviving 17th century guitars are mostly elaborately decorated instruments which probably represent the most expensive guitars of the time, made for aristocrats or royal courts. 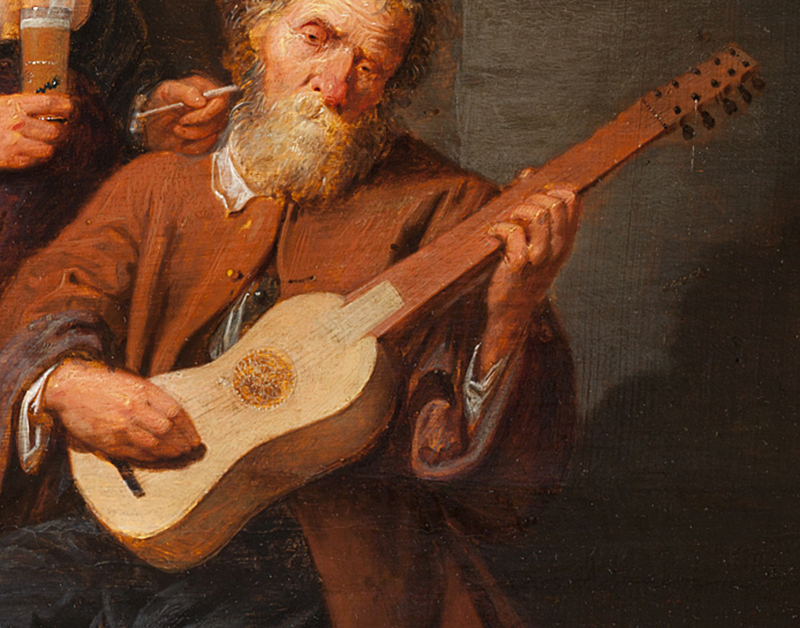 My guess is that 90%+ of the guitars made in the 17th century would have been simpler. 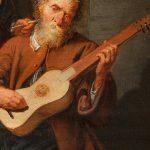 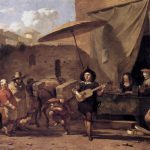 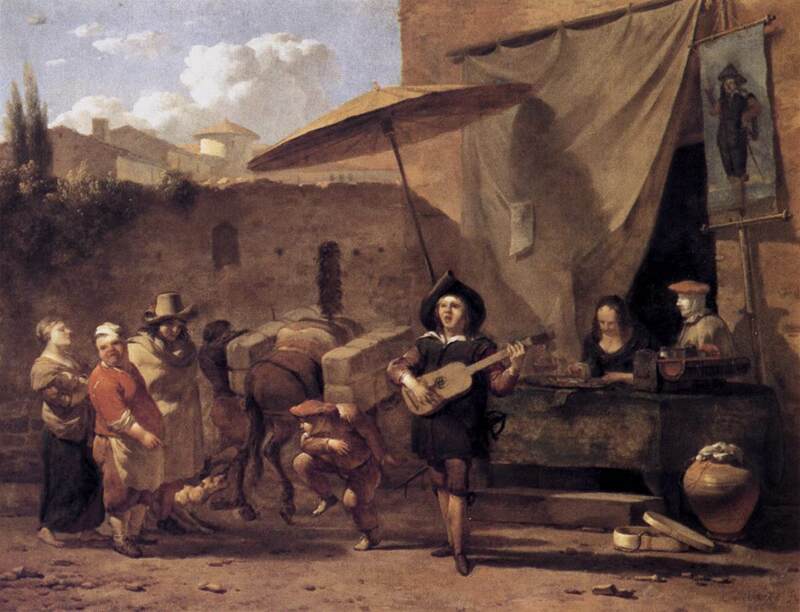 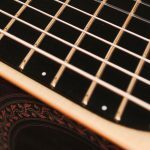 There are various 17th century paintings showing relatively simple guitars, which often seem to be made with locally available European woods, and without a lot of ornamentation. 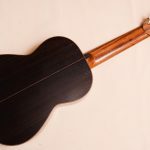 I’m taking the basic form of the instrument from surviving museum guitars, and the wood choices and details from paintings. 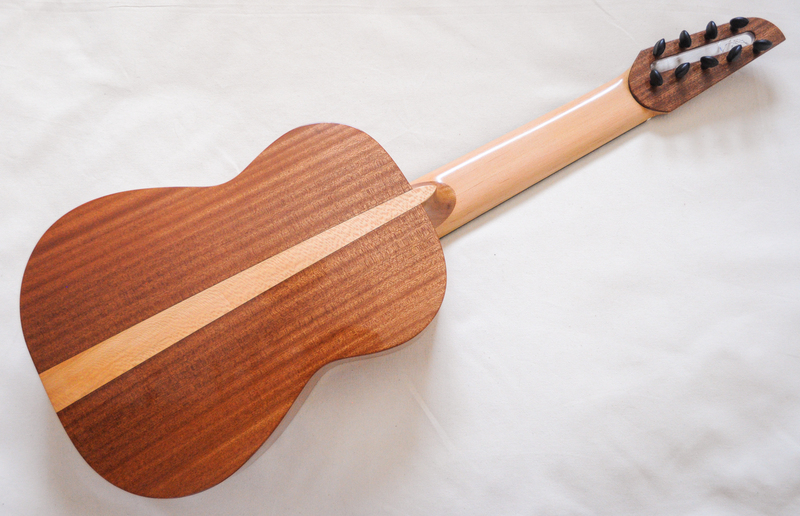 The second will be a semi-modernised version, with fixed frets, a bridge with a removable/adjustable saddle, and geared peg tuners. 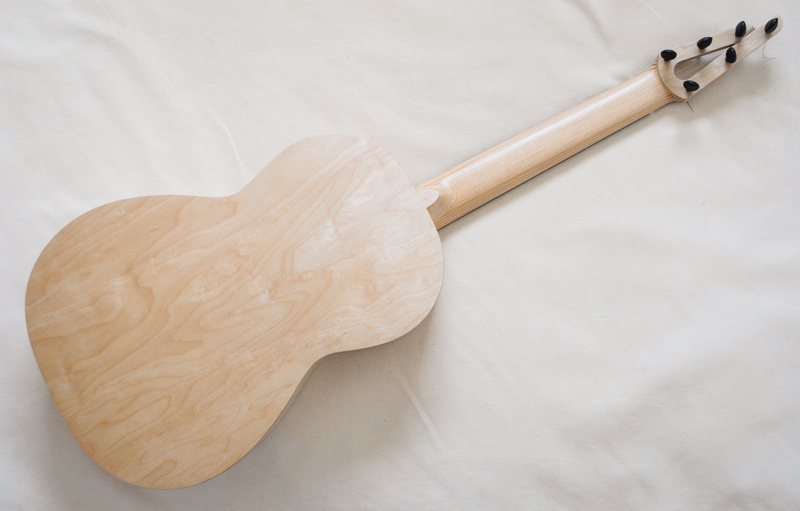 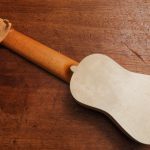 The aim of this version is to make a 5-course guitar which works in a modern musical context: i.e. 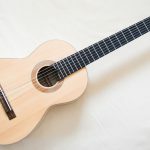 it plays “in tune” in modern equal temperament, and is quick and easy to tune accurately, so it can be used more straight-forwardly with other modern instruments. 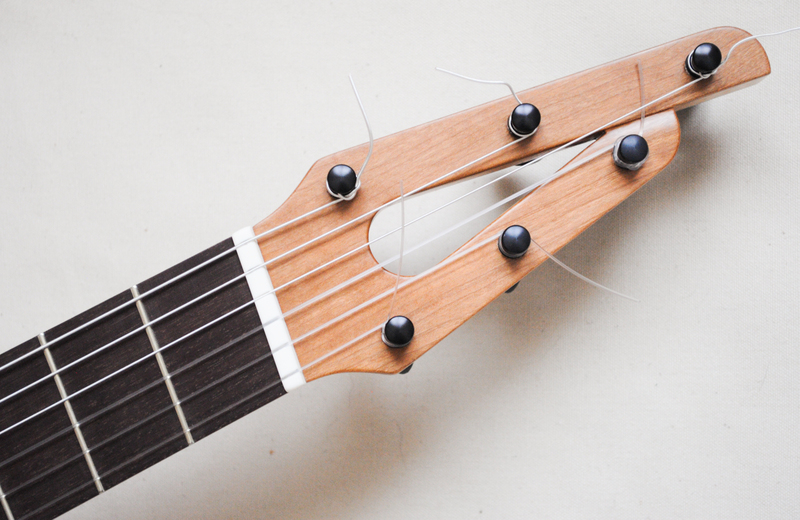 It should also be an easier transition for someone who’s used to a modern guitar. 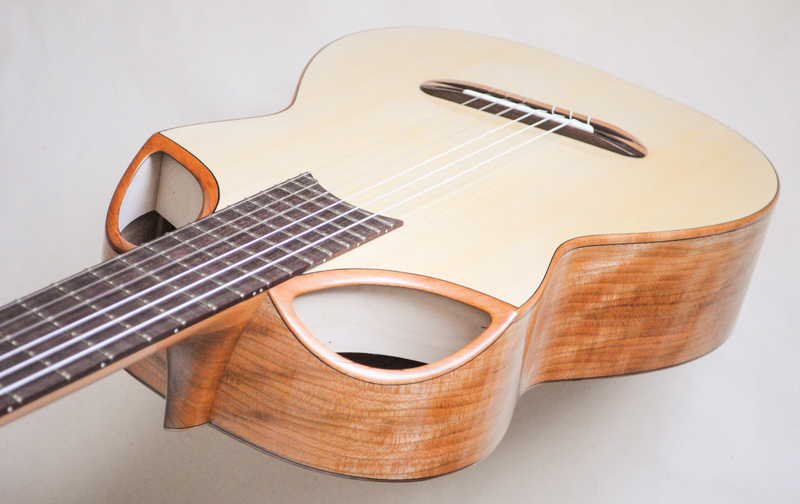 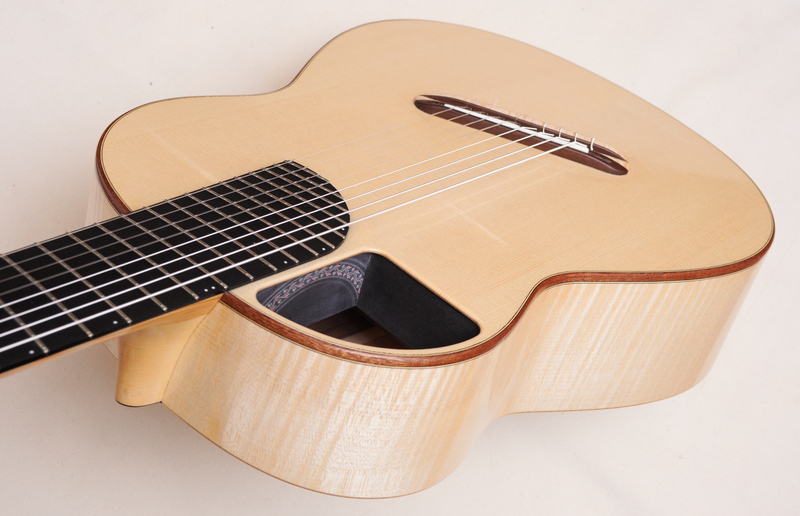 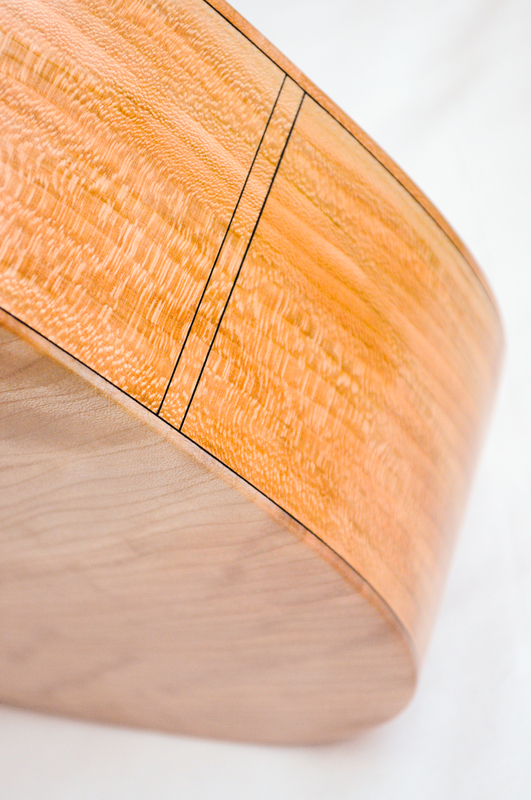 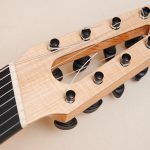 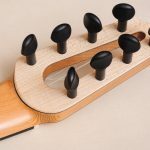 Just finished an 8-string Brahms guitar for Tomas O Durcain of the Dublin Guitar Quartet.